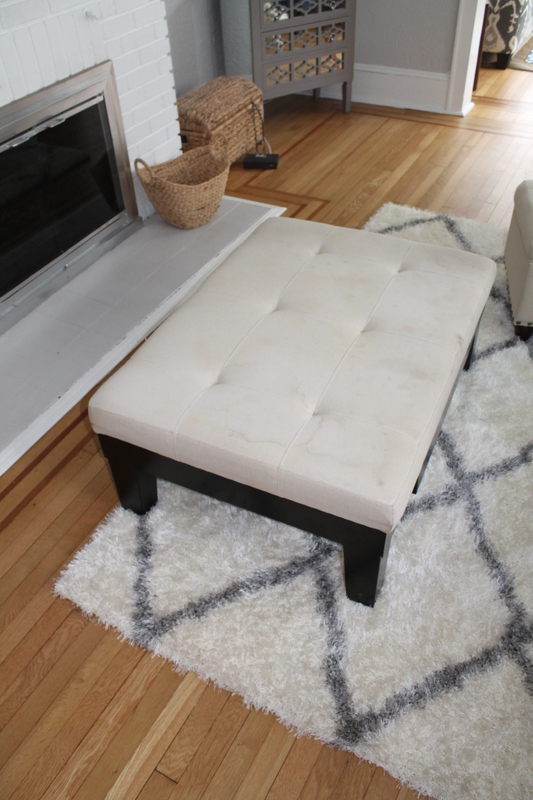 Home.Reno.Lover | DIY Expert-changing old things to new one day at a time! It has been AWHILE! I missed my DIY/Blog World!!! Hope everyone’s been great! Things have been a bit chaotic over here….I had a very eventful pregnancy (hence no postings or DIY projects really) and then we had our beautiful blessing of a baby boy in August! Sawyer Wyatt :). We are happily, tiredly, in a fog happy! 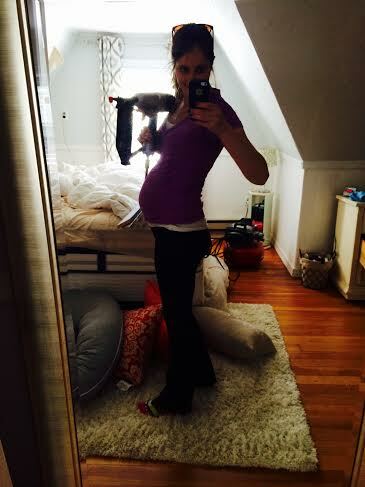 Mommyhood is intense…but I am loving it! I am also most importantly loving that he’s starting to take some longer naps so maybe I can get back into some furniture renovations! 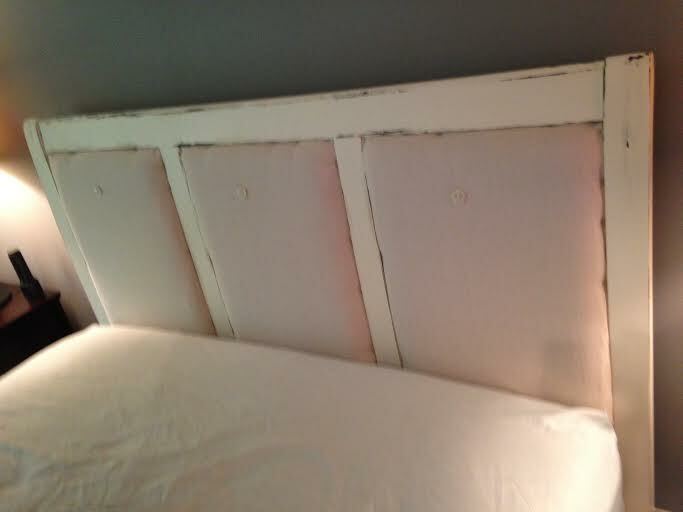 One project I did tackle while I was pregnant was redoing my headboard. I HATED the one I originally did. The color was all wrong and the border was awful. I had my eye on one that I wanted to try to replicate. 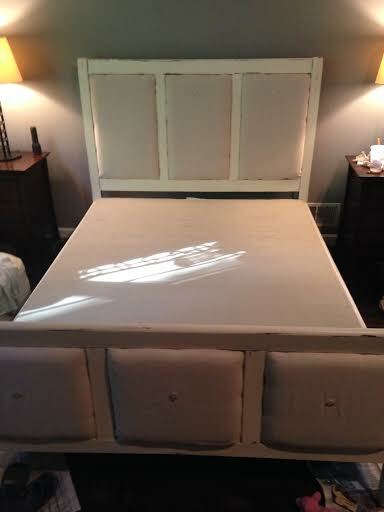 I first removed everything from the old headboard except the padding. 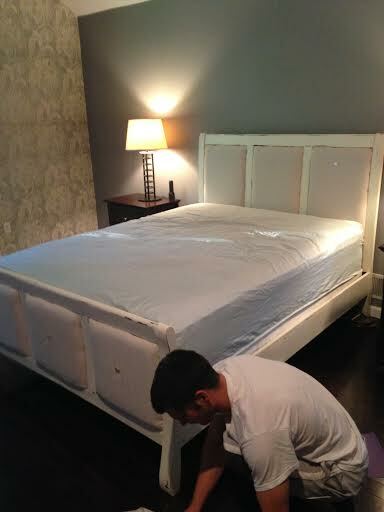 I added some extra padding I still had to the side to make it wider because we upgraded to a King bed! Next I grabbed some 2×1 wood. 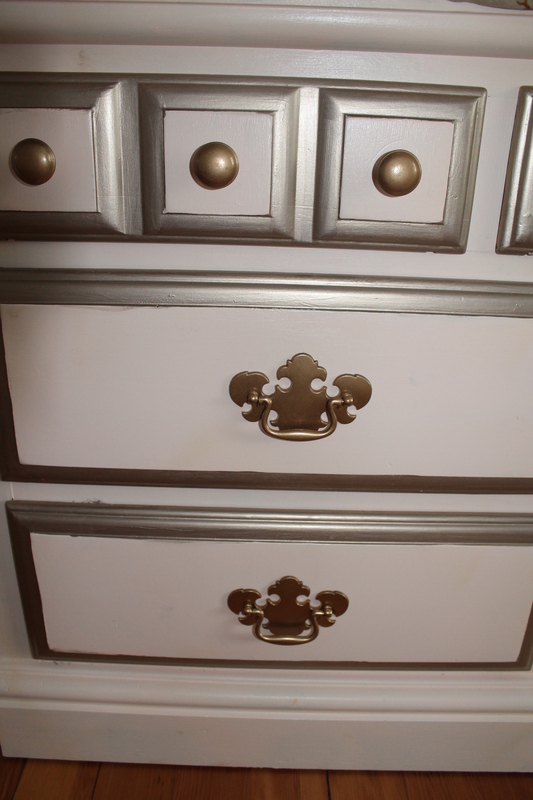 I actually didn’t stain the wood because I was pregnant and didn’t feel comfortable using stain …so I painted it brown! And then using a drybrush technique…I dipped a brush in white paint real lightly and then wiped the excess paint off so that basically all the paint was off but when you brushed it against the wood some light paint would transfer on. Hope that makes sense. 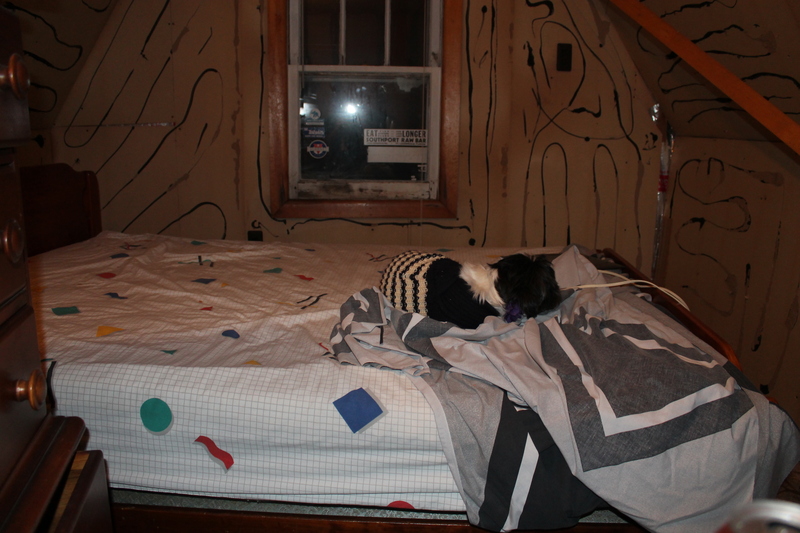 I then also immediately wiped the wood down with a rag to smooth it in. 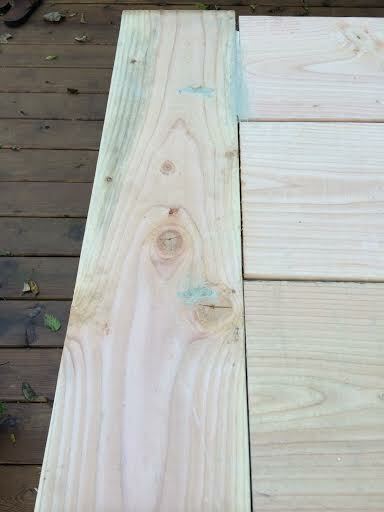 I used my miter saw to cut 45* angles to make the corners. 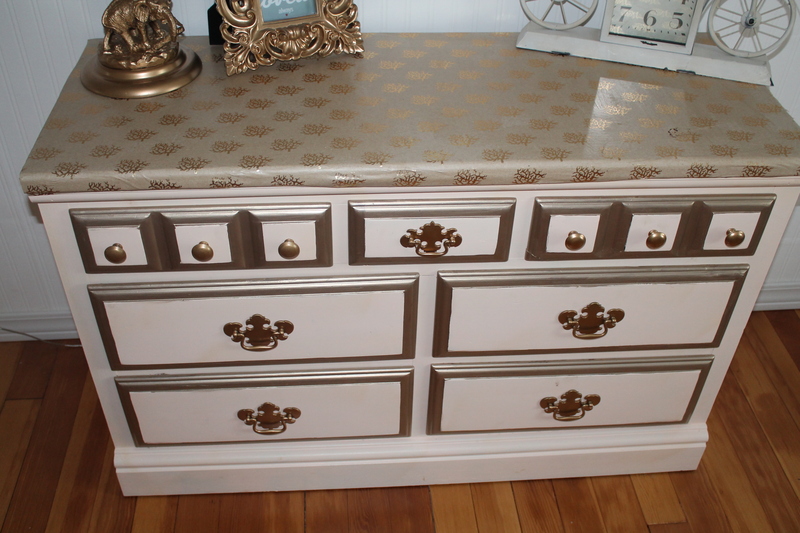 I used my nailgun this time to nail in the wood trim! 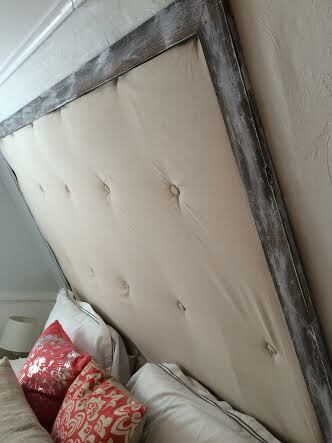 And voila’ beautiful new headboard! Hope you are all ready & gearing up for Thanksgiving! After that it’s go time for all Christmas everything! Yay! I’m a huge Christmas addict. 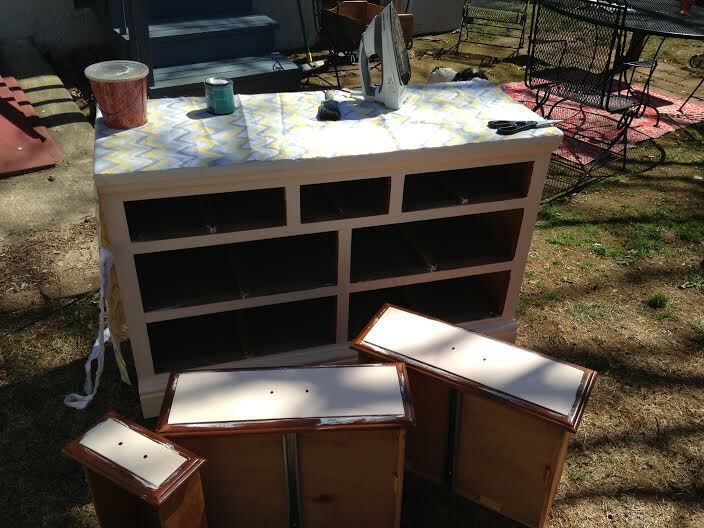 I recently refinished a table/hutch/and chairs for a gal in my area. 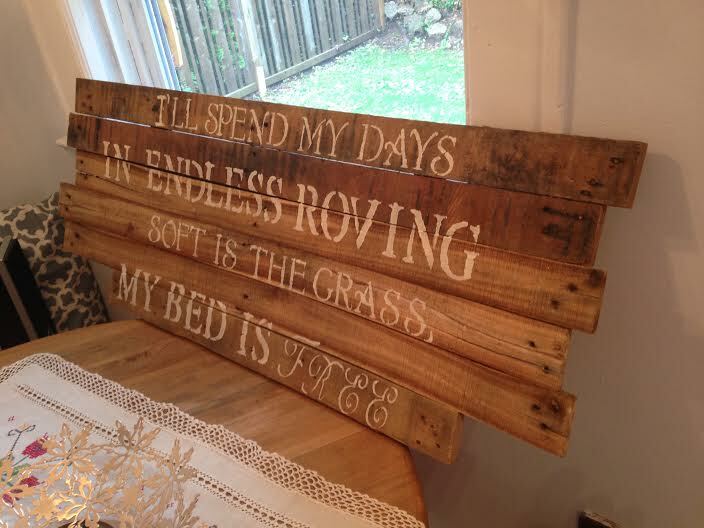 She wanted to take away the very “cottage” look and have more of a rustic/distressed look. These pieces were made by her grandfather which I thought was awesome! 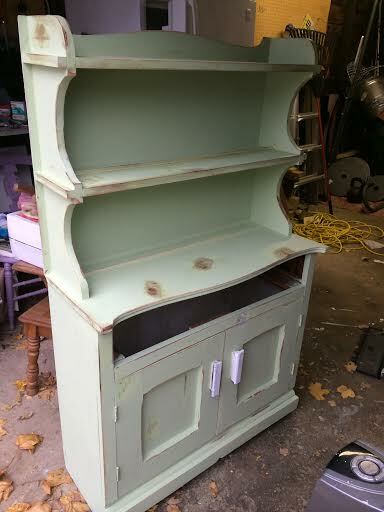 I love working with old pieces. 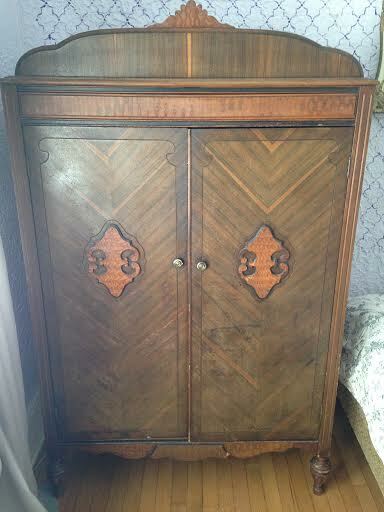 It also made me a tad nervous-don’t want to screw up gramps’ stuff! 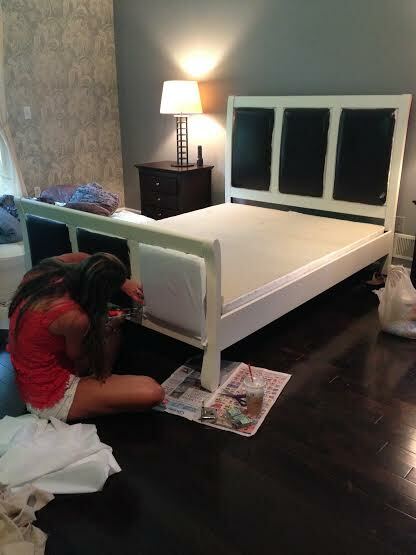 I had her pick out the paint colors she wanted. 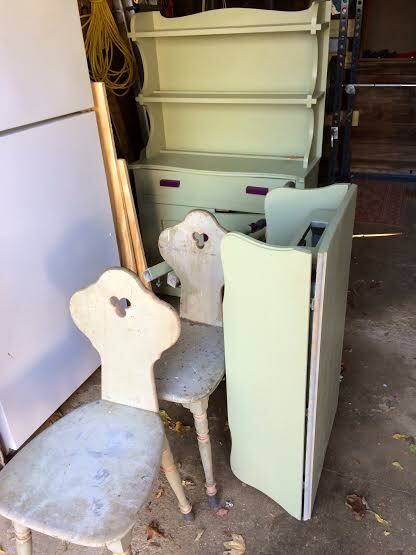 She was striving for a sage for the table legs/hutch, wanted the top of the table stained, and chairs painted 3 different colors-everything distressed, obviously. 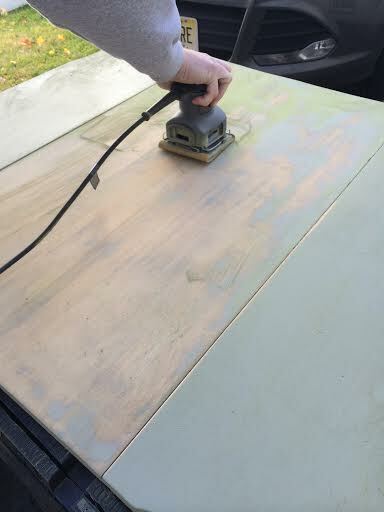 I started on the top of the table, sanding through layers of old paint is not my absolute favorite thing to do. I enjoy it but then get ansty when it’s taking awhile (which is always-when sanding down old pieces that have been painted more than once). 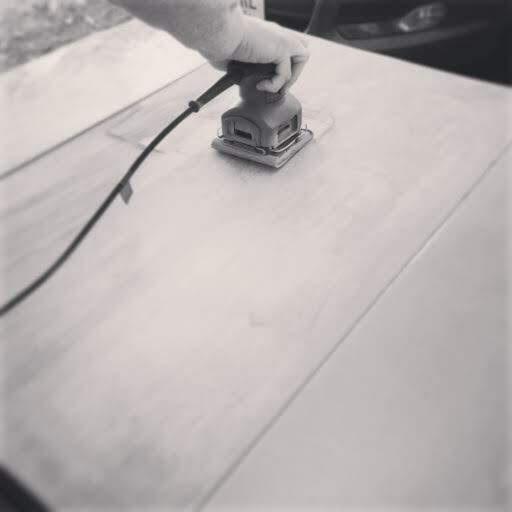 I used my handy dandy new ryobi sander and 80 grit paper for most of it. 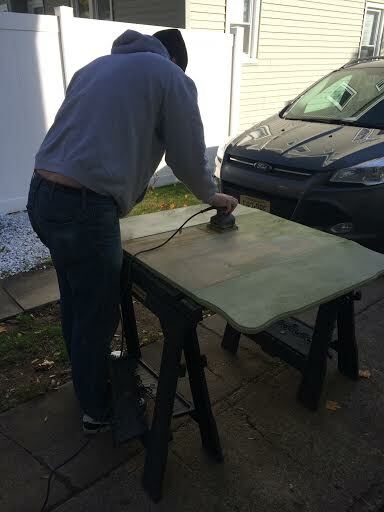 Luckily, the hubby came out to help too! 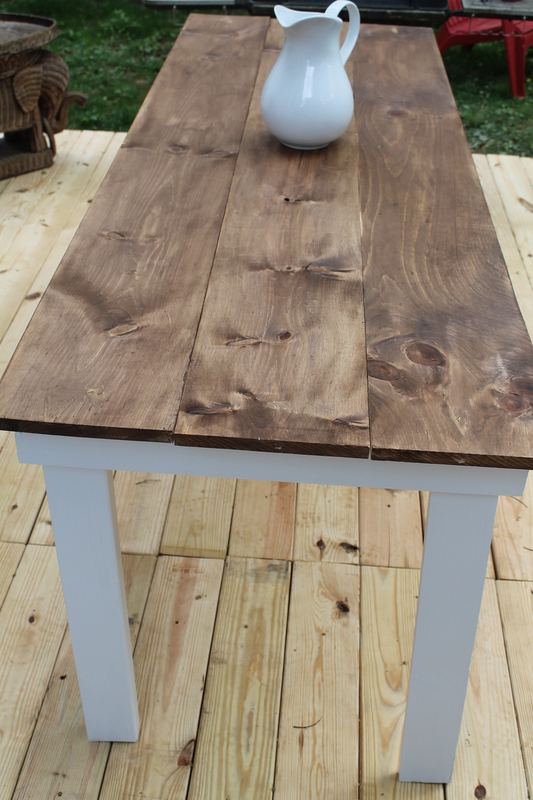 *TIP* Add a little mineral spirits to the table, wait 15 minutes (or what the instructions say) and then sand the piece. This speeds up the process GREATLY. 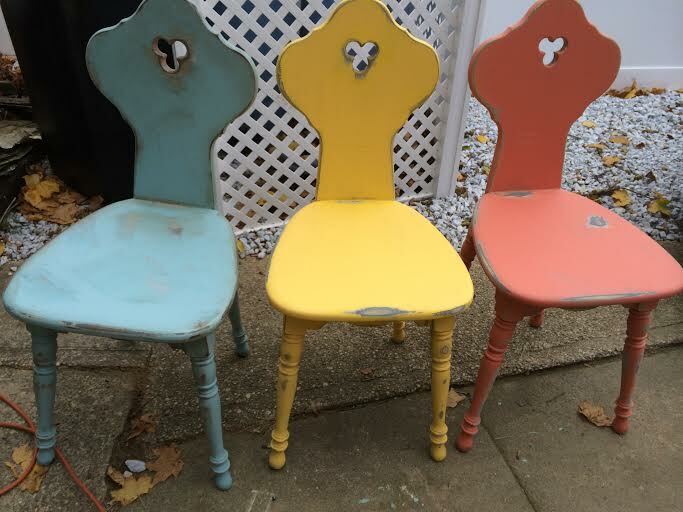 Next, I painted the chairs each a different coat of the colors she picked out. 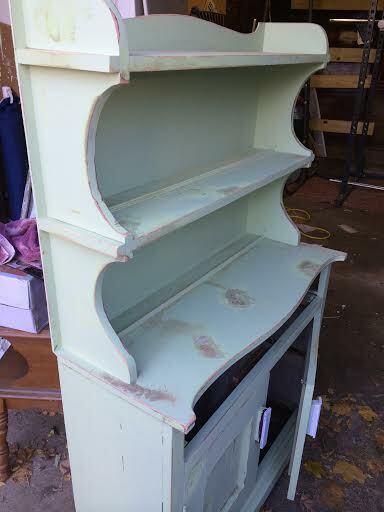 All the paint was in FLAT (this is easier to sand and gives it more of a rustic/distressed finished look). 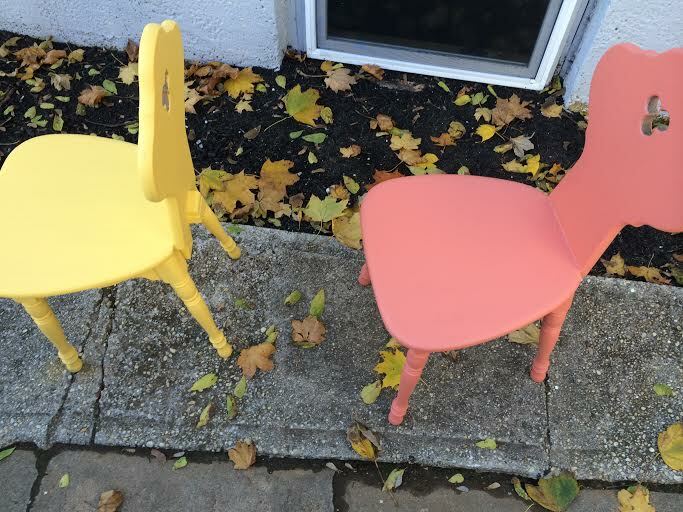 I then grabbed my ryobi sander and sanded each chair. 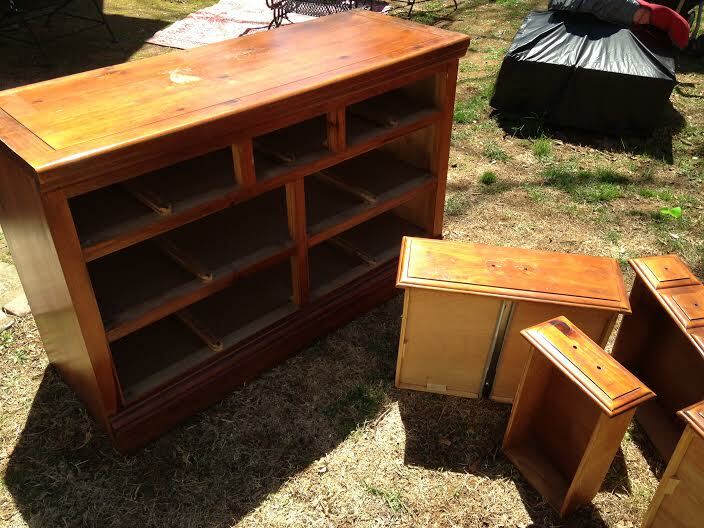 A Problem I ran into was that all the pieces were made out of pine wood. 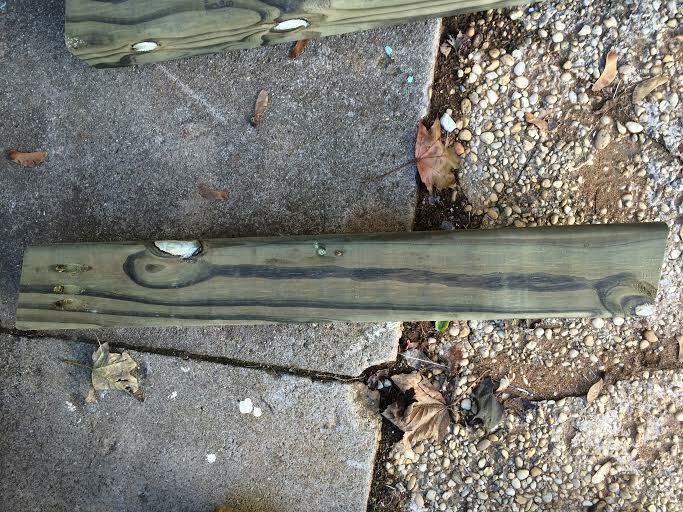 SO that means when sanded, the wood was light. 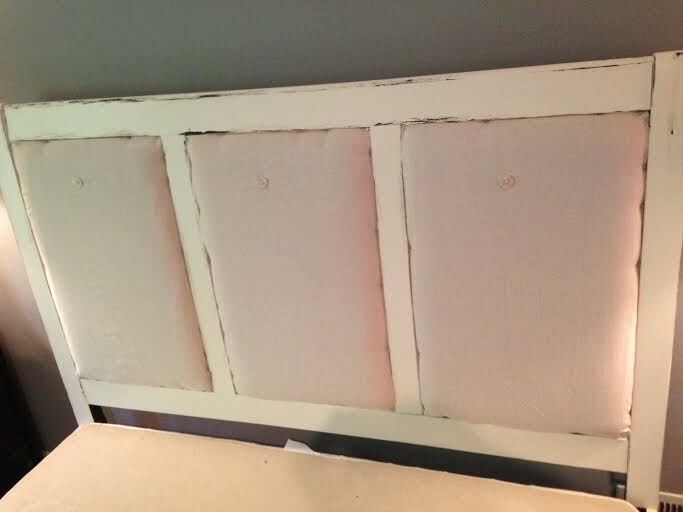 I knew she was going for the dark distressed look, so I stained each spot that was sanded. 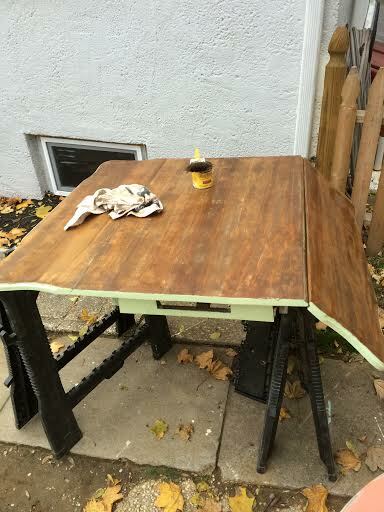 Next, I stained the top of the piece with my favorite Early American stain by Minwax. Just one coat. 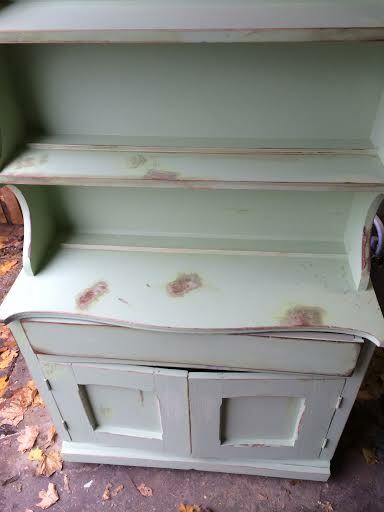 I then sanded down the edge to give it a “used” look. 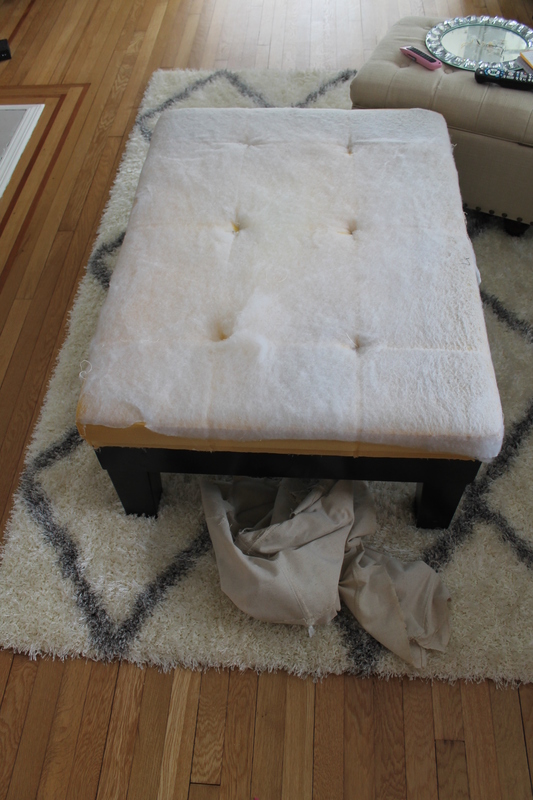 I then put a coat of Minwax Wax on top to protect from drinks being spilt and such. 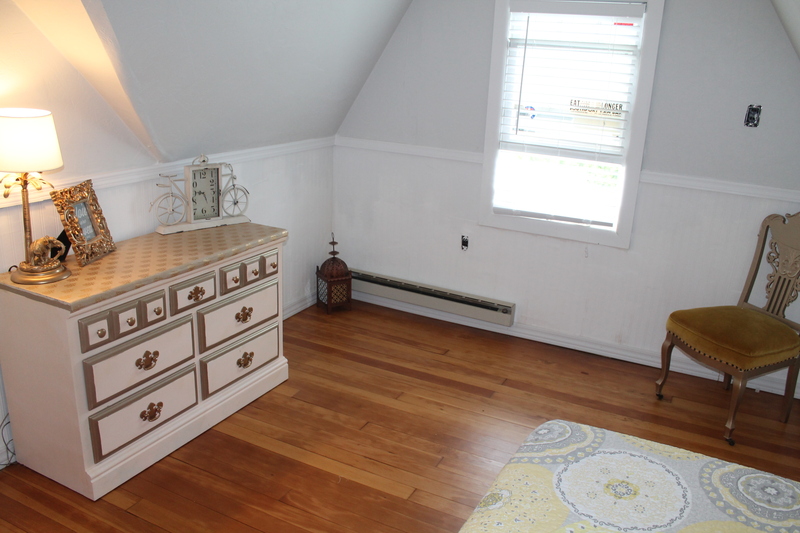 I love the wax as a finish because it doesn’t give such a finished look, like polyurethane does. 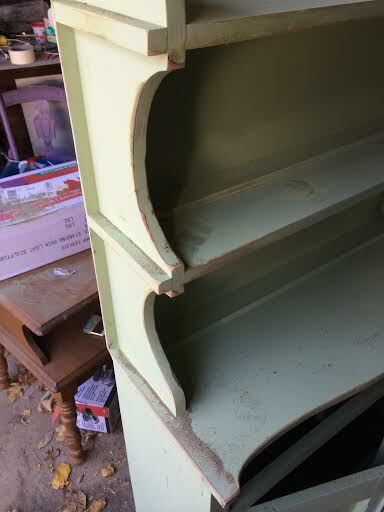 I also painted the trim that was on the top of the table, because it was not going to be able to be sanded down without ruining the pretty carving. 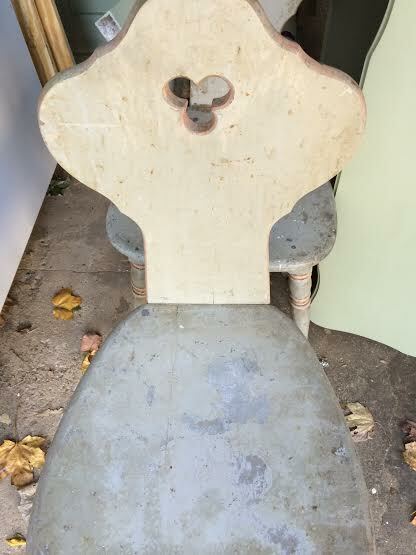 The sander would ruin the original work carved on. I knew this would look awesome and unique once sanded and stained. 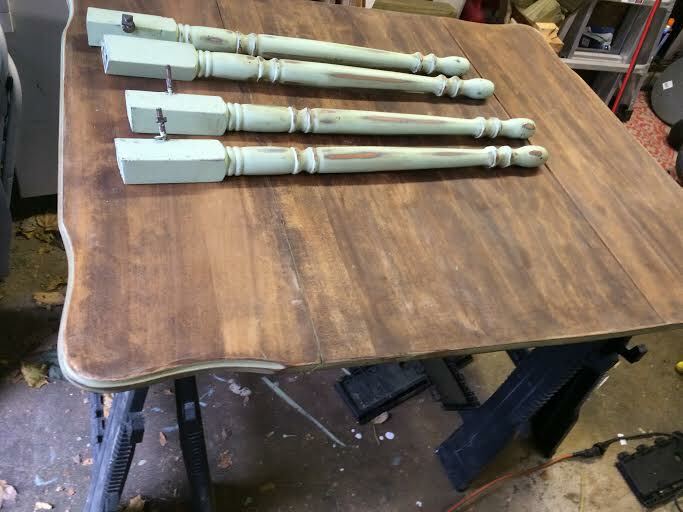 Then I painted the legs of the table. 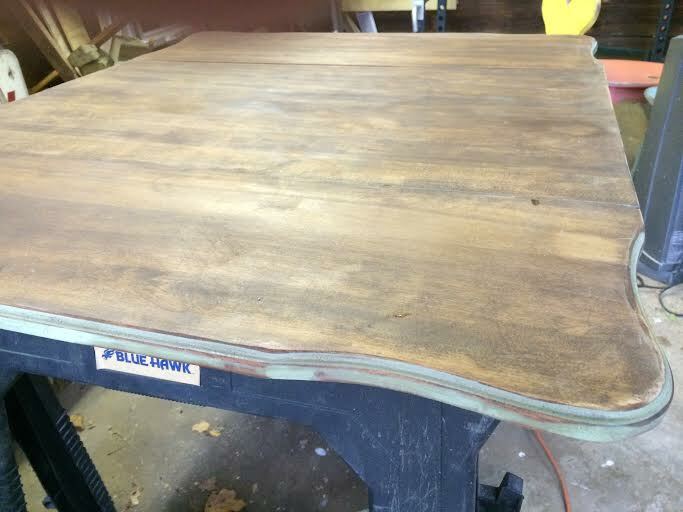 Same thing, with my ryobi sander I distressed them and then stained the distressed spots. 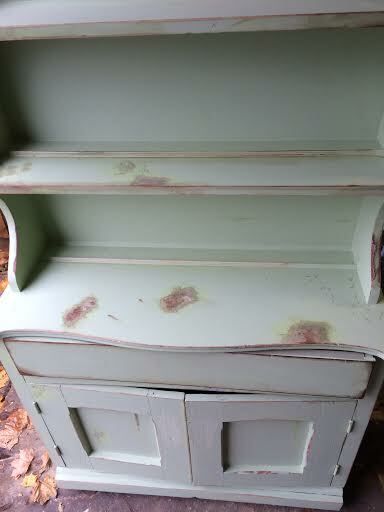 It really gave it a weathered/rustic look. 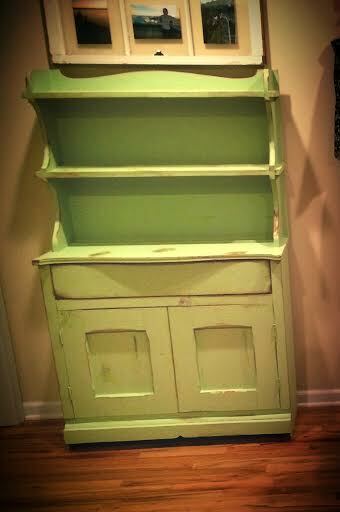 Last, I painted the hutch. 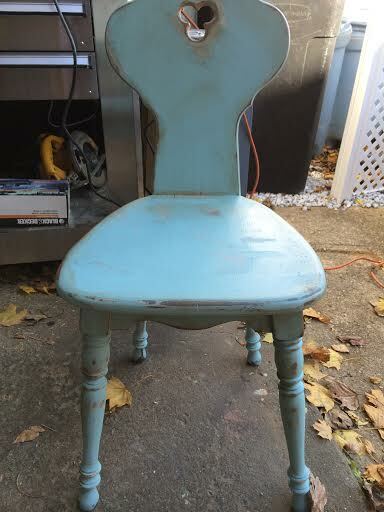 It was almost the same color that she originally had painted it but was a little more “sagey” and lighter. I took all of the original hardware off. 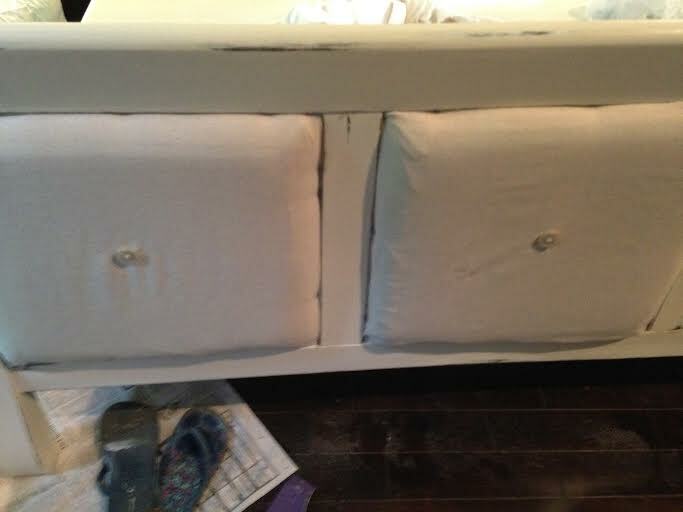 She wanted to put new hardware on, so I filled the holes with stainable/paintable wood filler. 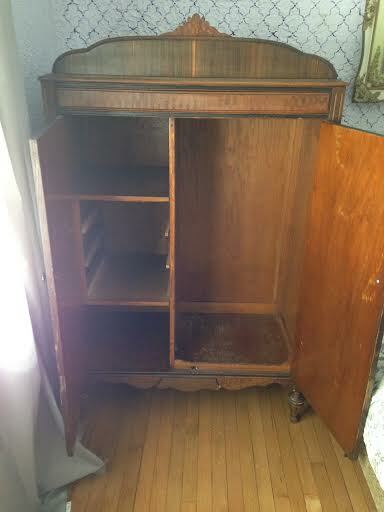 After the hutch was dry, I sanded it down and stained the sanded spots. I think it came out awesome! I hope you guys got some tips on distressing pieces! 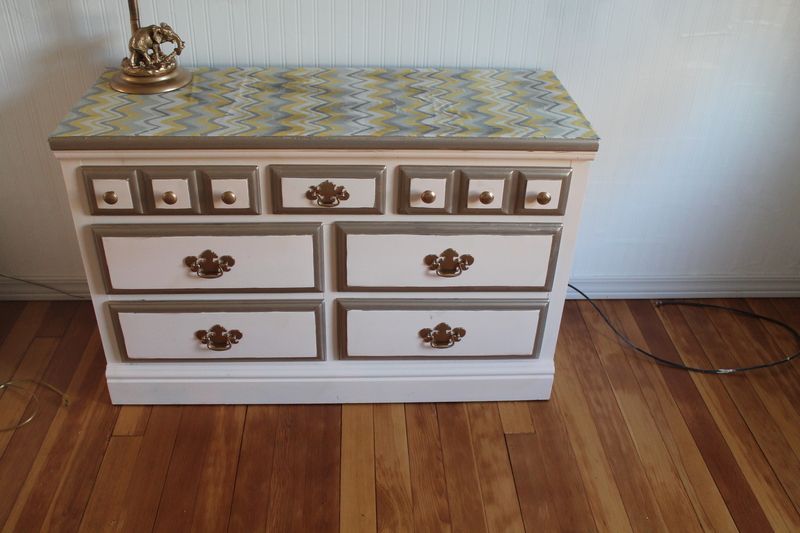 I had a blast refinishing her grandpa’s pieces, thanks Tasha! Hope you’re all getting your stretch pants out and stomachs ready for eating all that turkey and stuffing!!! Although, I think I love the side dishes more than the actual turkey, call me crazy! :). I wanted to show you a project I did for my friend, Jenn over the summer. She bought a beautiful huge house in the country (well it’s the country to me!!!). 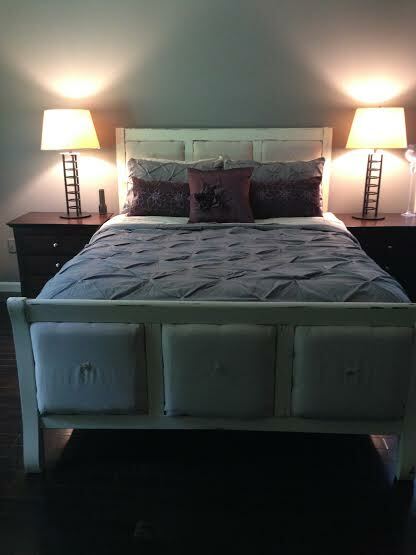 Jenn has so many beautiful pieces that she is refinishing and I felt so honored she asked for my help in refinishing her leather and wood headboard/footboard/frame. PLUS, she’s an artist and so cool ;). 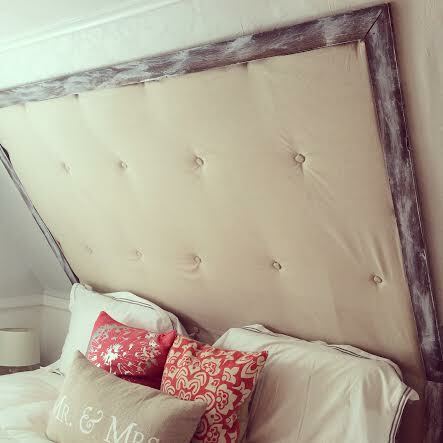 Jenn’s very creative on her own but was “stumped” on what to do with the leather squares on her headboard. 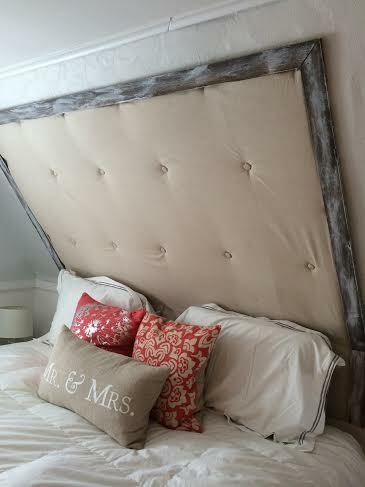 Jenn and I have the similar love for all things shabby/chic/rustic, so I knew I’d love to work on it with her! Unfortunately the leather pieces did not pop out. So, I had to get creative. I brought my handy dandy tool box and stapler. (I left my air compressor and staple gun home-felt that was overkill, damn). First, I told Jenn to paint the entire frame before we got started. 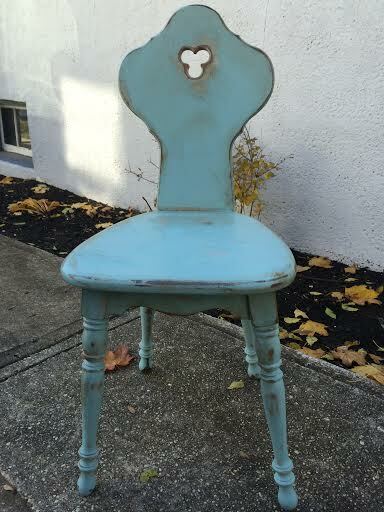 She used a flat white paint (her husband works for Sherwin Williams-score). After staring at the leather for a little while I decided to try tucking the fabric in and stapling. (yes, that simple) Jenn had gotten a bunch of linen colored fabric from Joann’s Frabrics. I had her cut out an inch larger than the leather square on all 4 sides. 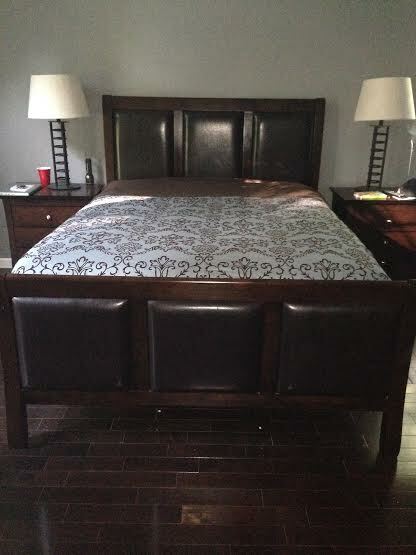 We also used two pieces of fabric for each square, since the leather was so dark we didn’t want it to show through. 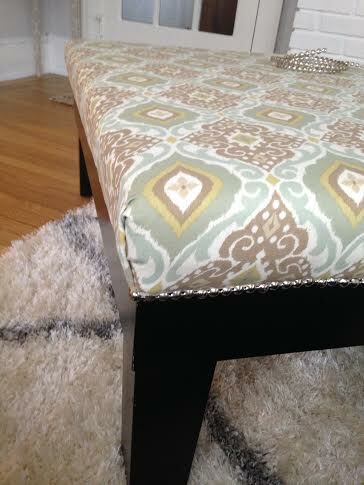 I just tucked the fabric in between the wood and the leather and stapled. Surprisingly, most of the staples you can’t see! Couldn’t believe it was that simple. We had trim we were going to add at the end, for the edge to cover the staples. We ended up not even using it because it looked so awesome without it. I’d say it took me about 2 hours to secure all the pieces to the leather and make sure the staples were hidden well. It was really coming together! 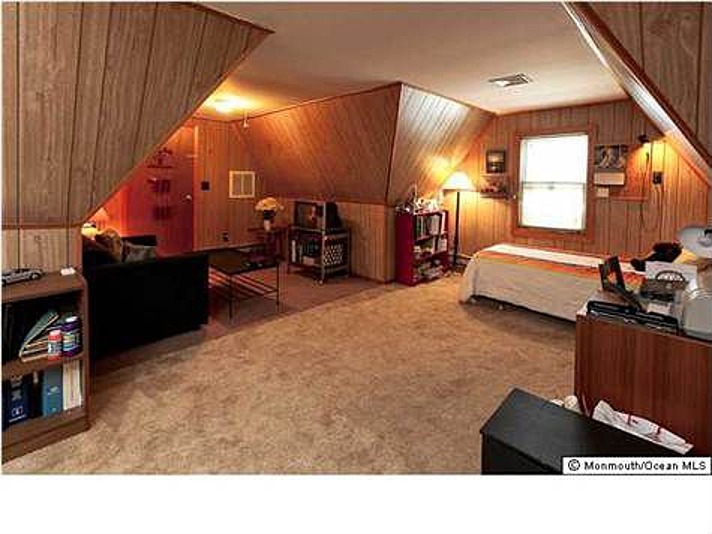 I wanted to tuft it as well. 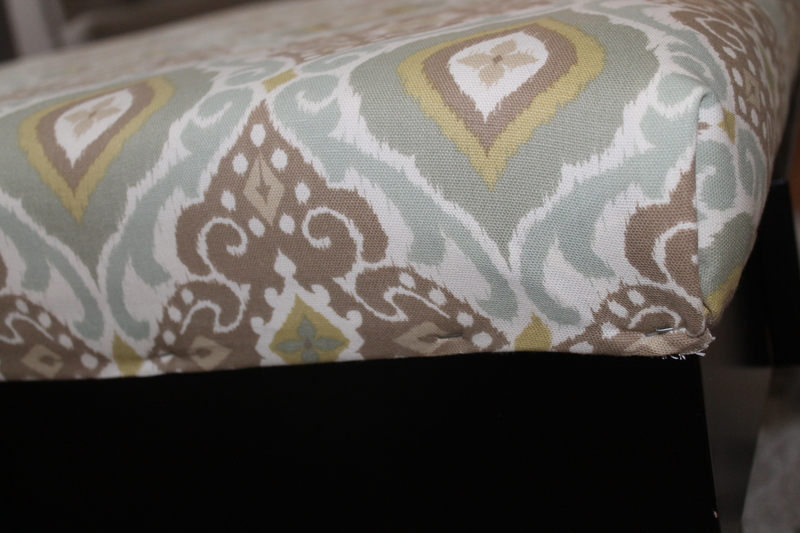 I took some buttons that Jenn had bought and just threaded them into the linen, snagging some of the leather to make it secure and pulled really tight,giving it that tufted look. This worked out great. 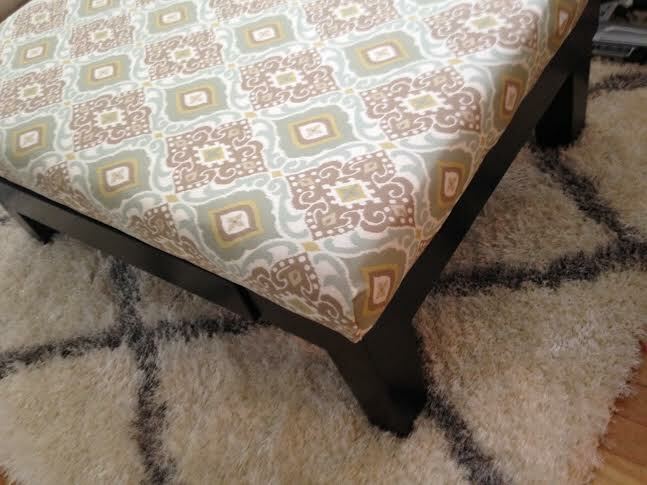 We decided to just do one button in the center of each upholstered piece! Lastly, we obviously had to distress it! 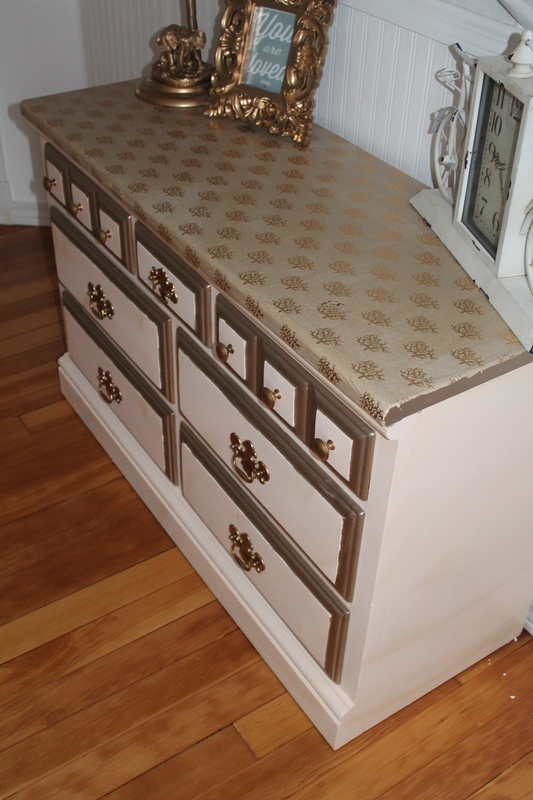 We grabbed 80 – 100 grit sandpaper and sanded all the edges to give it that real shabby-chic distressed look. 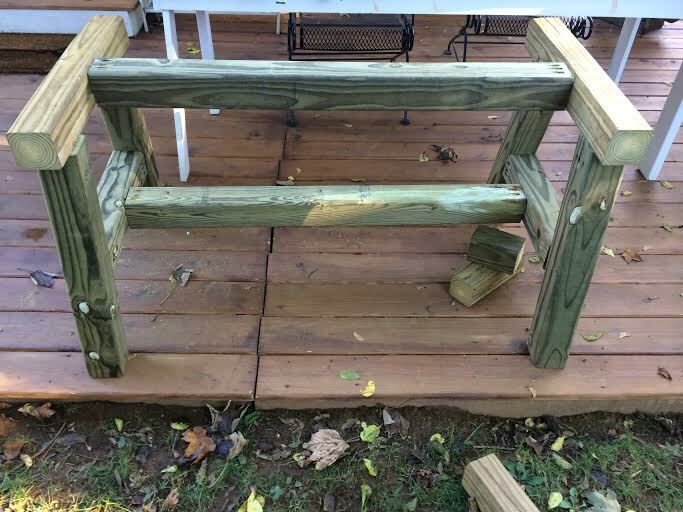 It looked awesome, since the original wood underneath was so dark. I LOVE LOVE LOVE how it came out and I hope Jenn does too. Hope you all had a fantastic weekend! 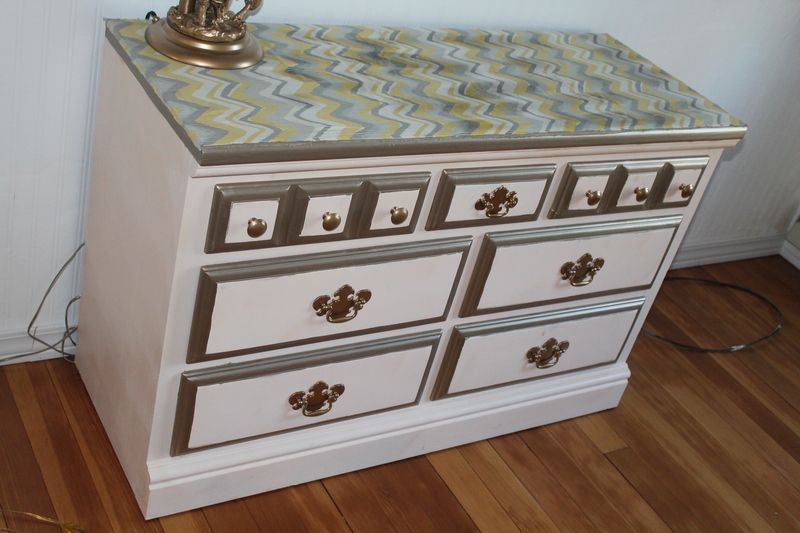 I wanted to give you a quick post on a piece of furniture I refinished. 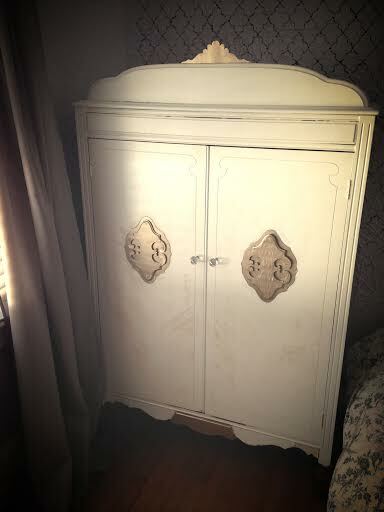 I have been posting a lot of renovations and wanted to show/remind you how easy and quick it is to find an old piece of furniture and bring it back to life! I LOVE finding pieces at the curb, it literally makes my day. I notice I drive around afterwards blissfully happy :). HA! And I’m not kidding! 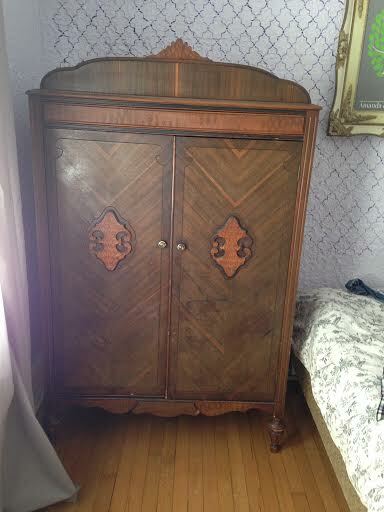 This piece my mom got me from a garage sale for $40! 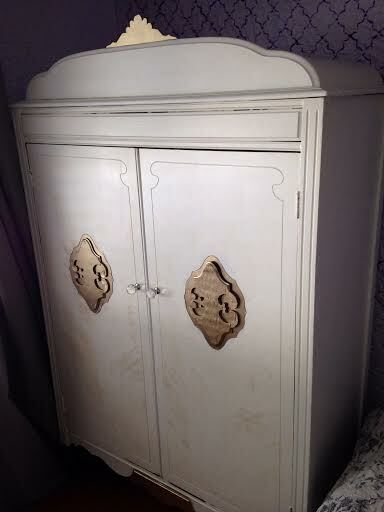 It’s an old armoire and when I saw the design on it, I knew exactly what I was going to do with it. 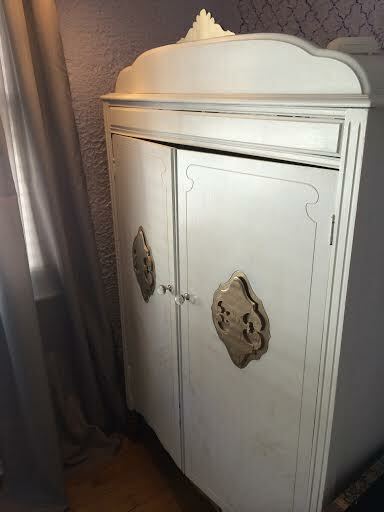 Well it sat in my garage for about a year and a few weeks ago I finally got around to putting it in my guest room and paint it! 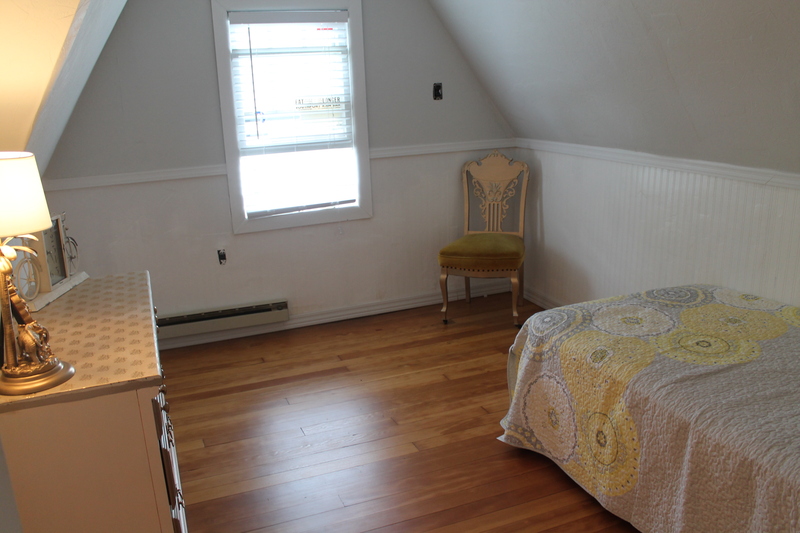 I still owe all you guys a finalized blog post of my upstairs. I have slowly been furnishing it and finishing little things that needed to be finished. 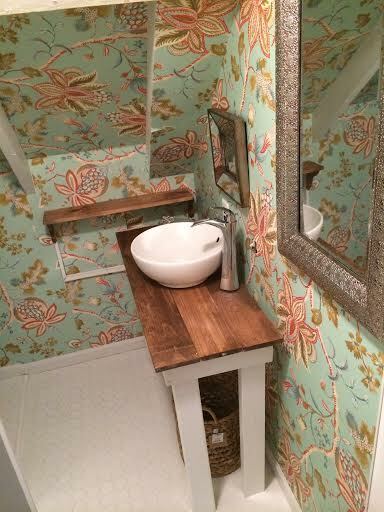 But mostly ONE YEAR LATER I have finished the bathroom upstairs. Yes. It’s been a year! I was taking my time because I wasn’t sure what I wanted to do. But I think I aced my vision. 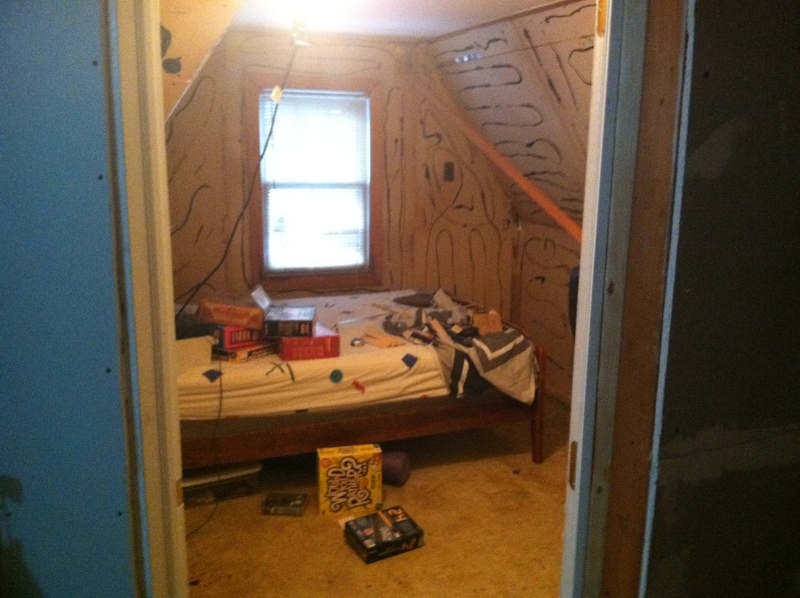 Here is the ONLY pic I have of the bathroom! Sorry!! But you get the point. 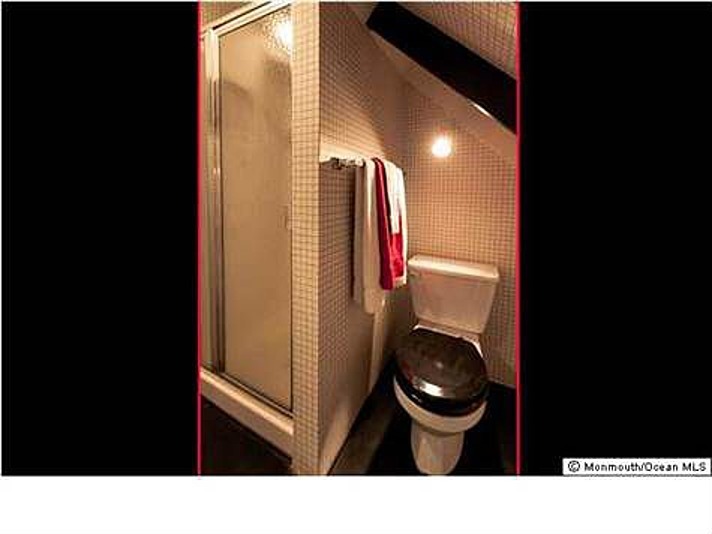 Black and White wallpaper all over, black floor, black beams, black toilet. Ugly sink vanity & mirror. 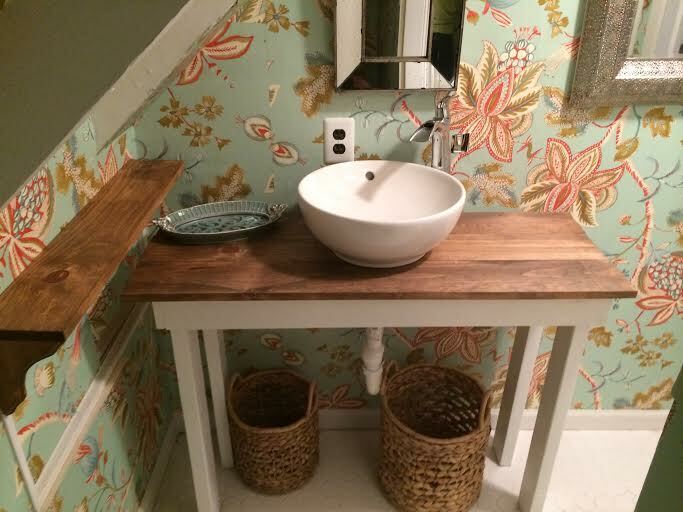 After I finished the upstairs (stay tuned because I’m going to post a reveal) I started in on this bathroom. 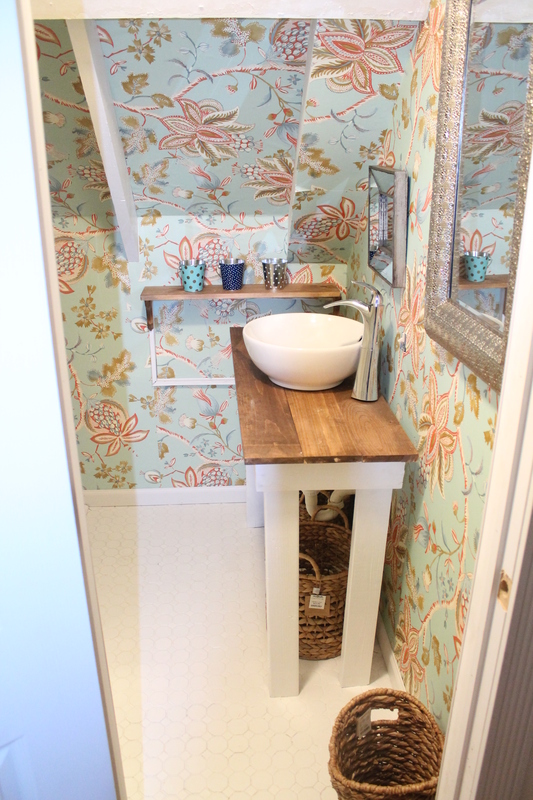 It is the smallest bathroom that has ever been invented in my opinion, especially for two very tall adults, but it works! I’m not high maintenance (ha!). The shower was surprisingly in very good shape with white tiles and a glass door. I wanted to redo that as well with grey subway glass tiles, but after a lot of persuasion from the hubby & friends, I let it be. AKA in a few months I’ll tackle that too! 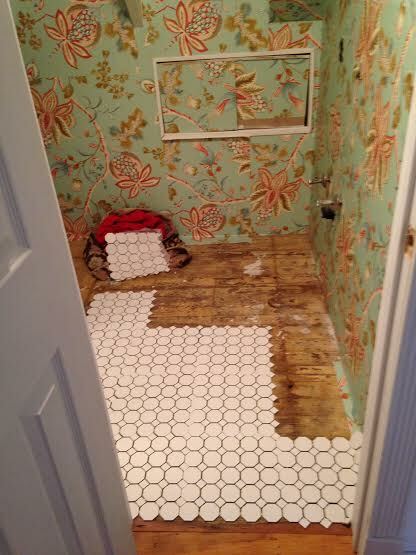 I ripped the tile up & all the wallpaper off. Painted the black beams white. Wallpapered the walls and put in new cute white tile for the floor! 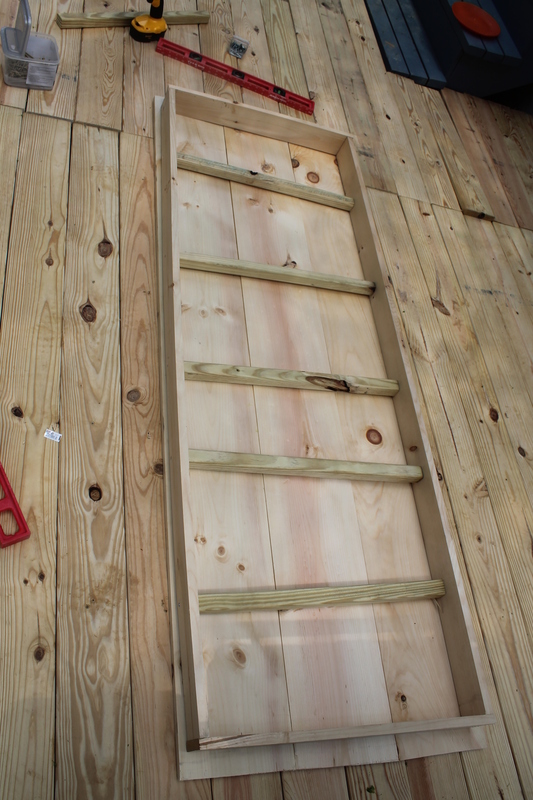 Added trim for around the bottom base of the wall and around the door! 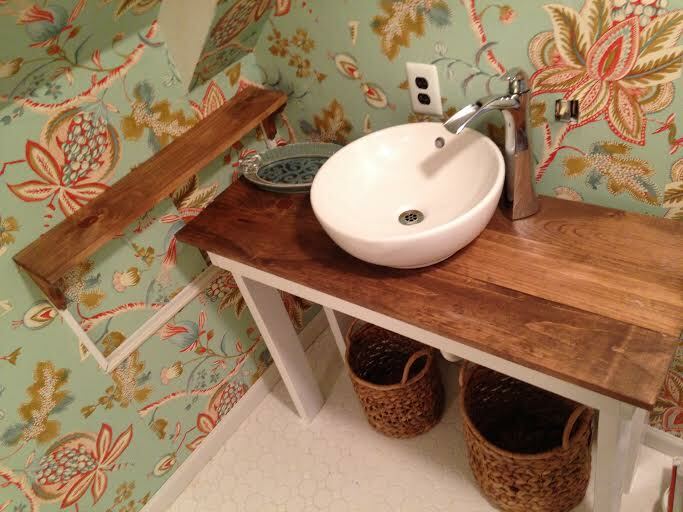 I knew I wanted a sink vanity that had room on the right and left of the sink to put stuff. 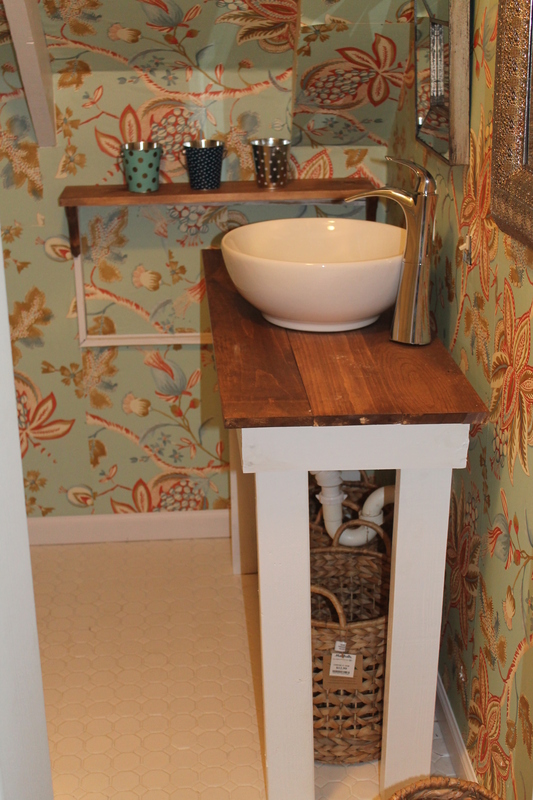 Since the bathroom is so small I wanted this it act as a shelf as well. I based my measurements off of this. Also, note where the water hookups are when measuring! Cut 3- 1×6 to 43in (TOP). 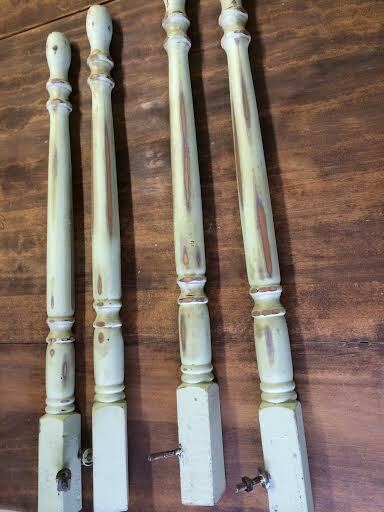 I painted the legs and sides white and let those dry overnight. 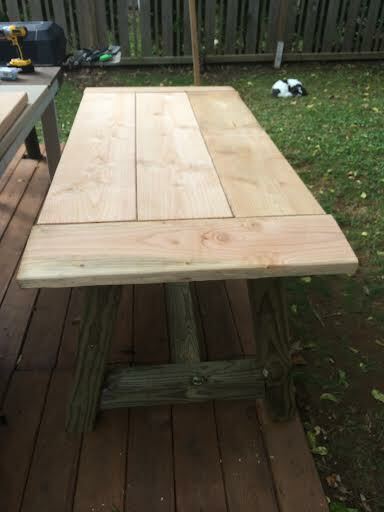 After the stain was dry, I kreg jigged the top pieces together. I borrowed my brother in law’s hole saw and drilled a hole a little larger than the drain hole of the sink bowl. Unfortunately, he didn’t have a hole saw big enough so I had to fudge this and play around with getting it big enough. 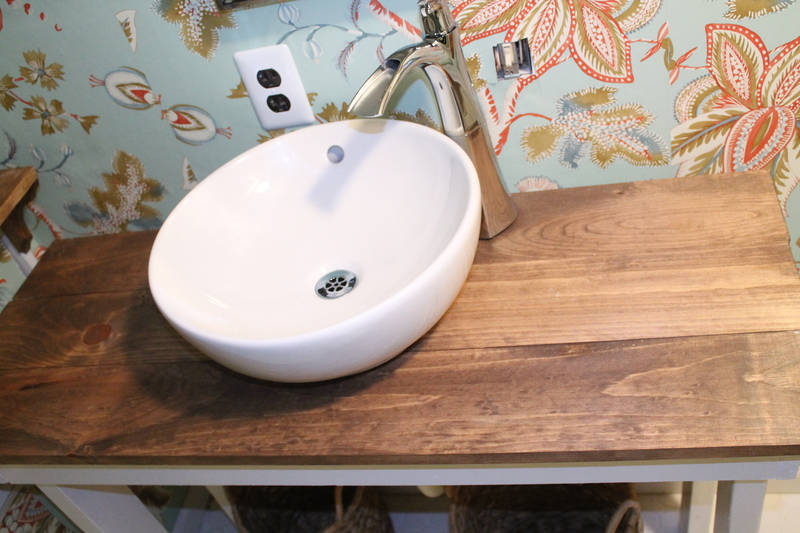 You don’t want it TOO much bigger, but big enough that that sink drain fits in snugly. 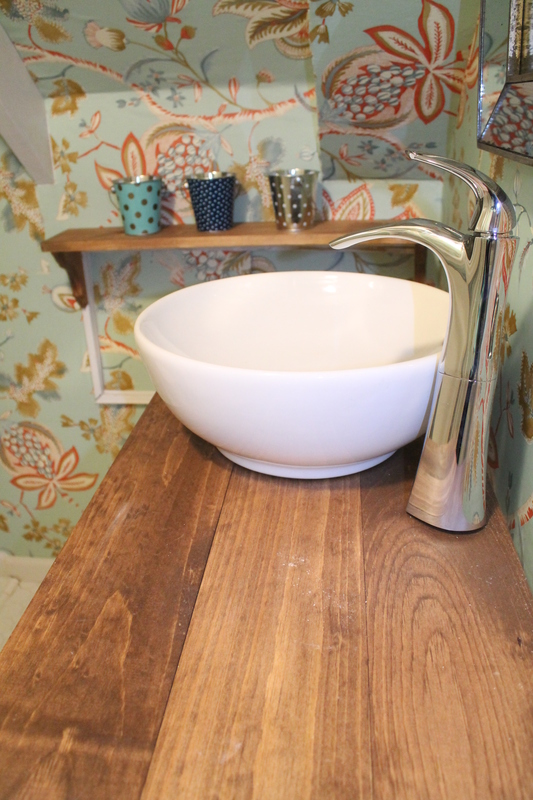 I placed the sink bowl and faucet on top and my handy dandy husband hooked it up for me!! And Voila’!! 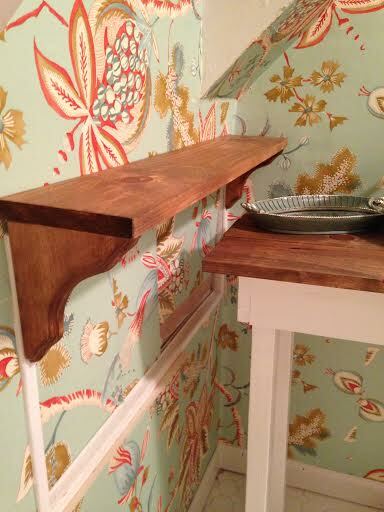 I made shelves, similarly to the ones I made for the kitchen, to match the top of the vanity. It has been way way too long! I miss my blogworld! Unfortunately, summer came-which meant long beach days and night time bonfires/wine! Meaning, no blogging! But I’m back! 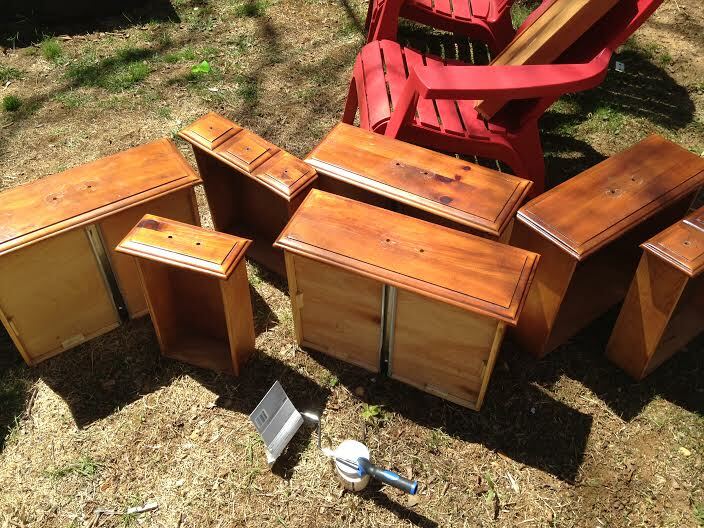 In between the beach & bonfires, I did keep up with my projects! So stay tuned for my upcoming blog posts on all the projects I finally completed! 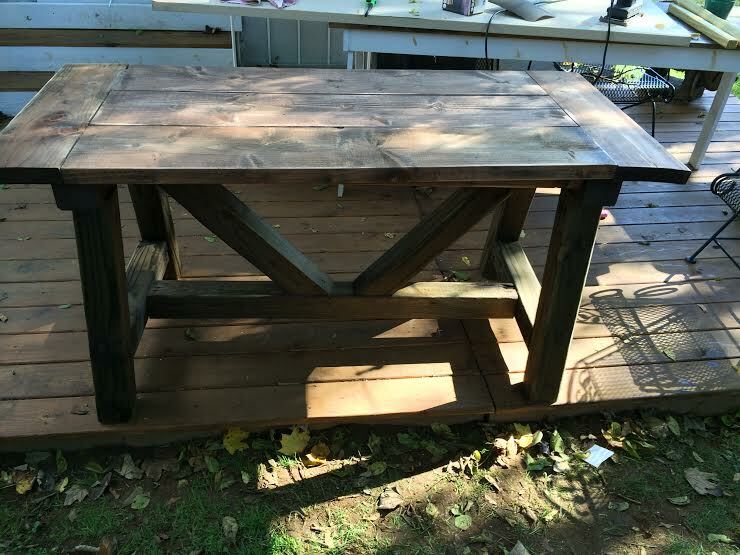 I wanted to give you a tutorial on this beautiful Restoration Hardware table I replicated. 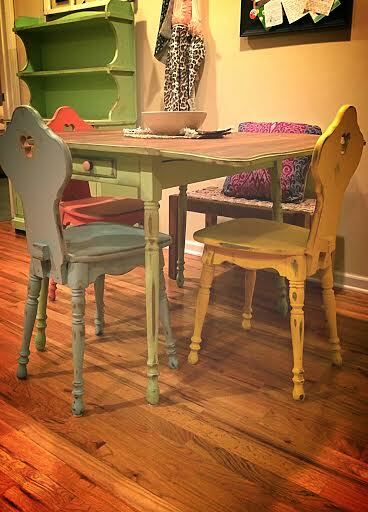 I had a cute round table in the kitchen nook’ area, that I redid when we first moved in. 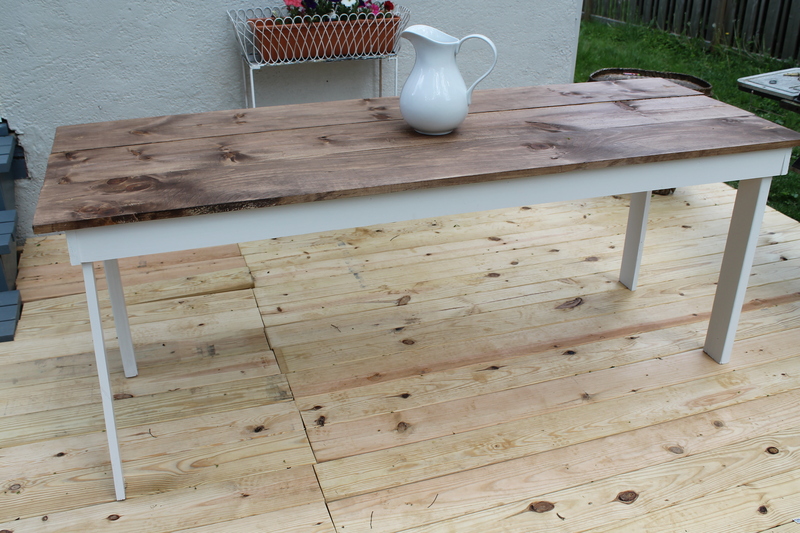 It was a table left behind by the owners, so I just sanded the top/stained it and painted the base white. 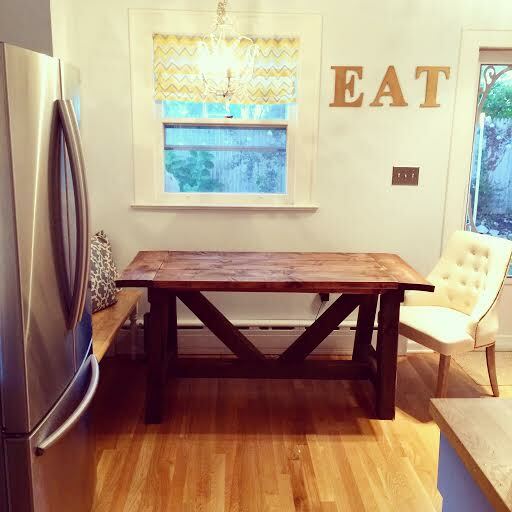 It was perfect for the first year, but now that our kitchen’s almost totally completely finished, I wanted to make a longer table so we could actually sit in there and be comfortable! 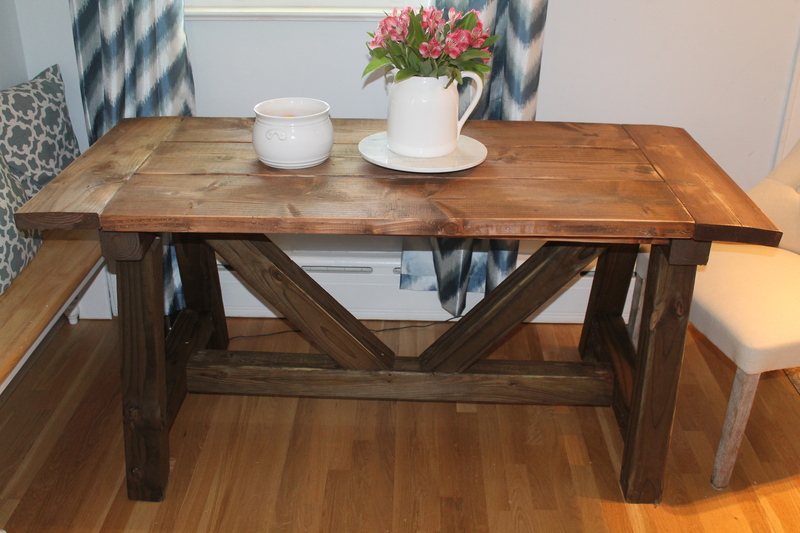 I LOVE rustic wood tables. I could make them all day/everyday. 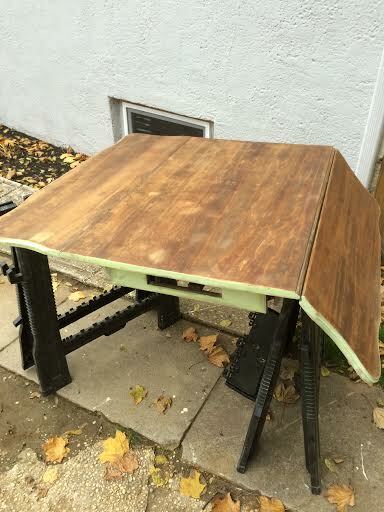 I wish I could sell this table on my etsy account, but it would cost $1,000 to ship probably, due to the weight! ( So locals, I am making these to sell for pickup/dropoff)! 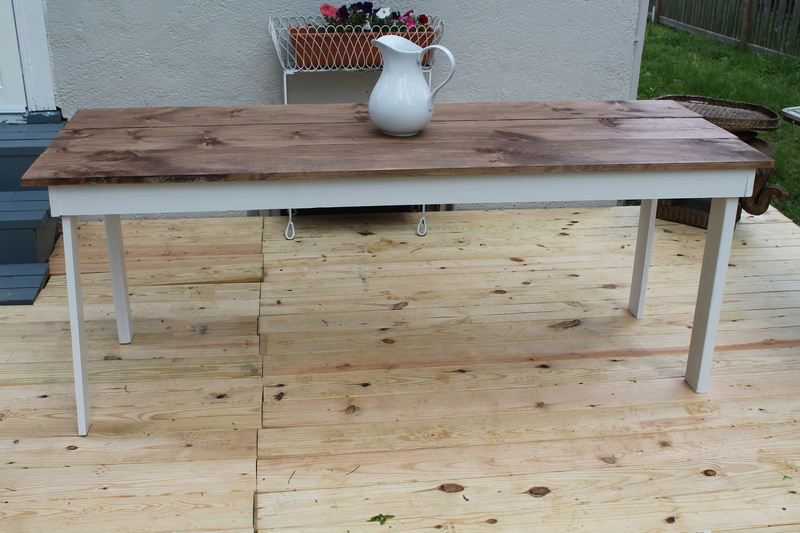 I reviewed ALOT of plans for this table, it’s very popular. 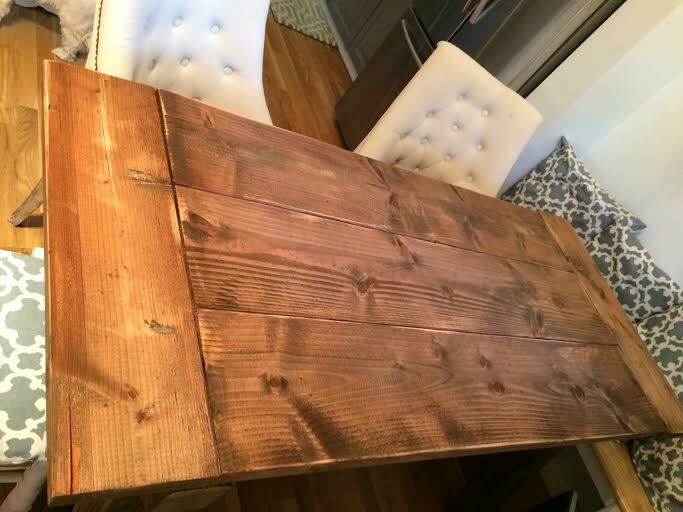 I wanted it to look like this table from Restoration Hardware-that started at $2,300. 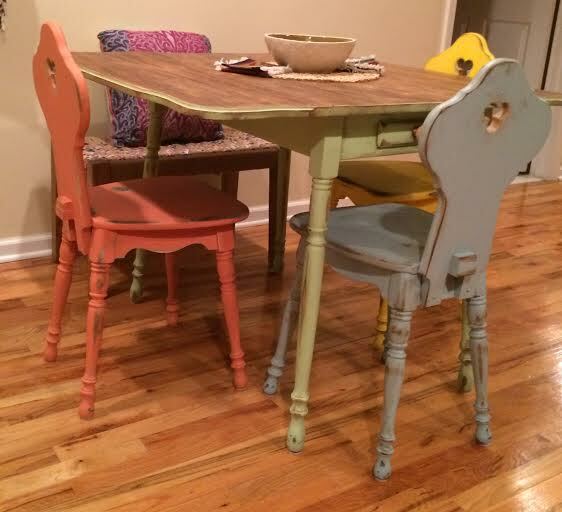 I love shanty2chic blog and checked her out for her plans. 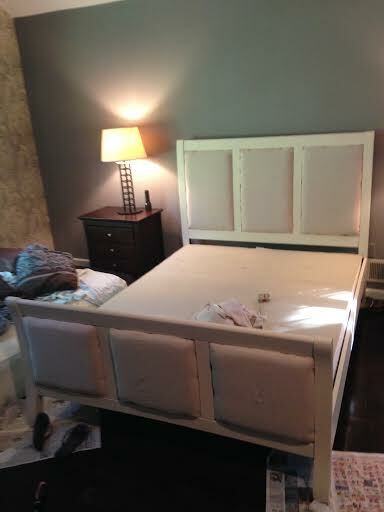 I also OF COURSE looked at what Ana White did, because she’s the bombass’ of the furniture building world. I bought all my wood from Lowes. I knew I wanted my table an exact size, due to the room I had to work with (not a lot). *I wanted my table to be 63 in long. I wanted to have the breadboards at the ends though, so I needed to get creative. I decided to use 2×8 at the end’s instead of the 2×10. However, these instructions are for 2×10 at the end as breadboards! I wanted the width to be 28in. This is 3 2×10 for the width. After I made all my cuts, I started with the legs first. See Ana White’s instructions for detailed photos of how it should look -but my cuts are different lengths keep in mind. 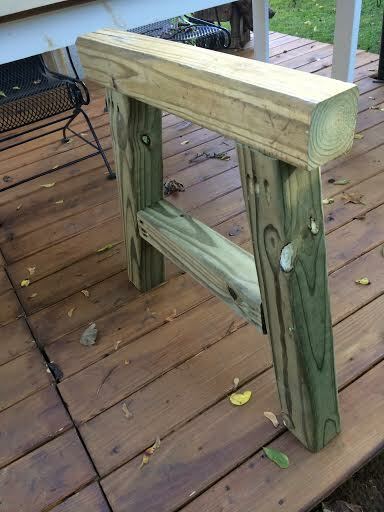 I used my kreg jig to make pocket holes and have secure sturdy joints. 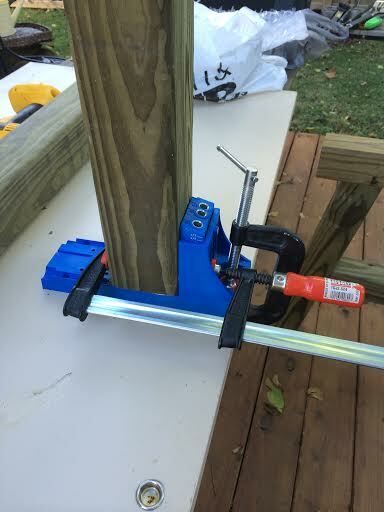 I used my 2.5in kreg jig screws to attach the legs. 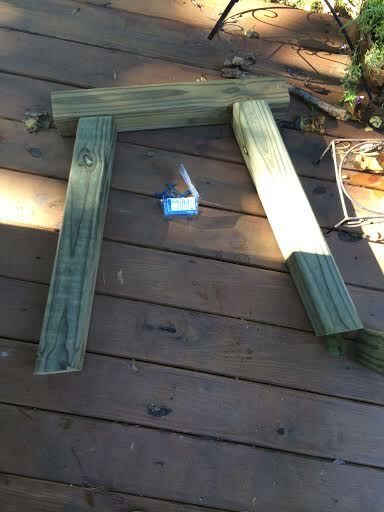 After attaching both set of legs, I laid the one set of legs down. 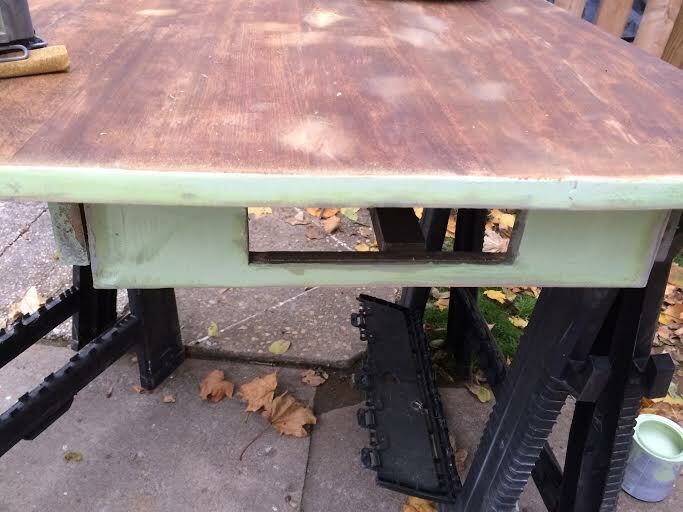 I grabbed my bottom 45in beam, added pocket holes with my kreg jig and screwed the beam into the middle bottom beam of the legs. I then did the same to the other set of legs so that the beam was holding the two legs together. 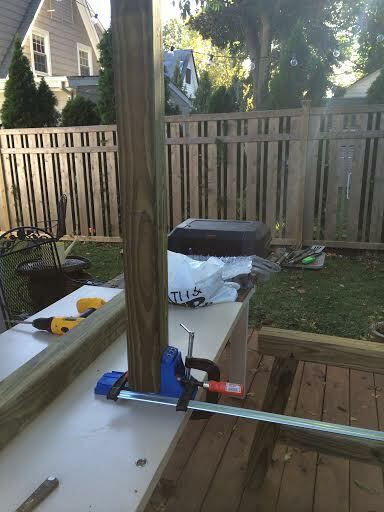 You want to do this with the top beam piece as well. Make sure the beam is centered on the center beams of the legs. 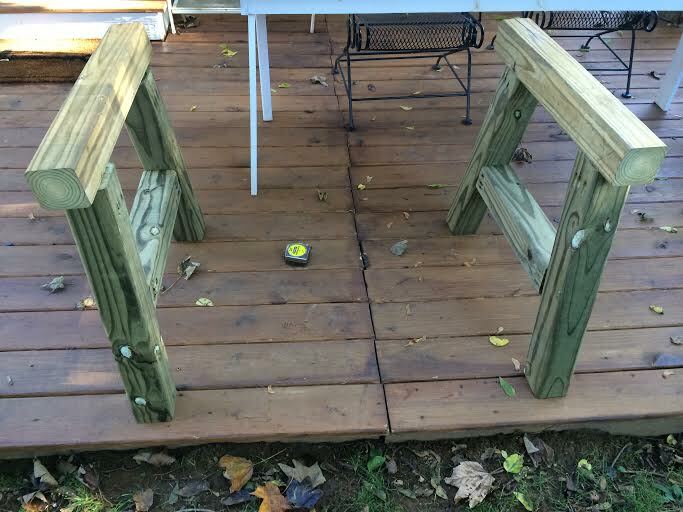 HINT: Measure the beams of the legs and find the center and mark that. Place the 45in beam at that mark and it will be centered. Grab your 4×4 at 26.5in with the 45degree cuts at the end. These are going to be your cross pieces for underneath. They look SO great so don’t skip them. I had to play around to get them to look even and sit nicely. 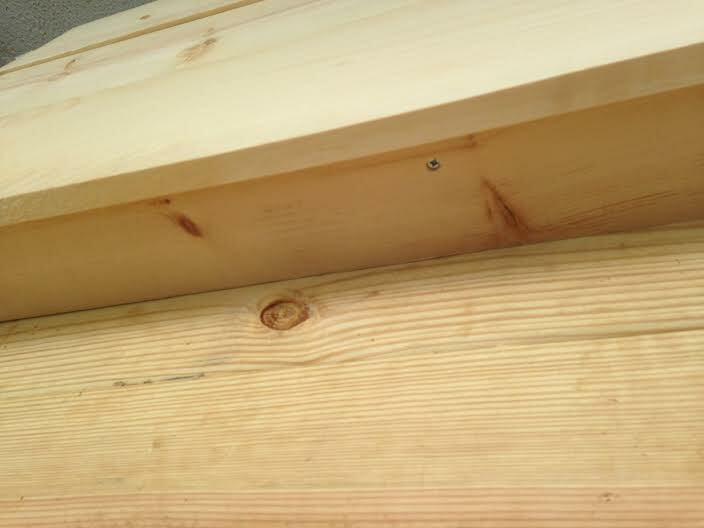 Easiest way is probably to mark your center on the bottom beam and measure from that center to where the top long part of the 45degree cut will sit on the top beam. Make sure this is 26.5in. IF it’s not, no biggie just cut to that length. Hope this makes sense. I had to make a few cuts. Put kreg jig holes on each end and screw in with your 2.5in kreg jig screws. Grab your 3 2×10‘ @ 48in. I put kreg jig holes in the center and ends of each piece. This is going to hold all 3 of them together. Grab your 2 2×10 @ 28in breadboards. Put kreg jig holes on each end on the TOP and BOTTOM of these pieces. This is so it holds more sturdy. 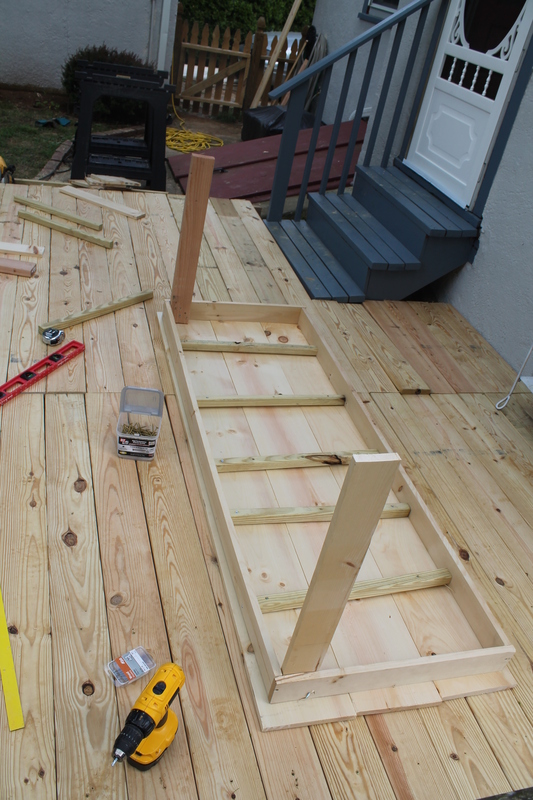 After you attach all of these pieces together with 2.5in kreg jig screws you can use your wood filler to cover the top kreg jig holes that were on the 28in breadboards. 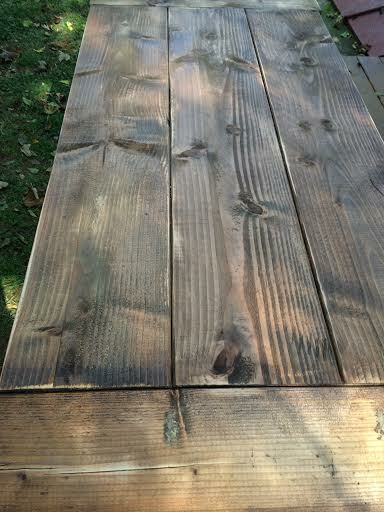 I then used my favorite minwax special walnut stain and brushed it on the wood. 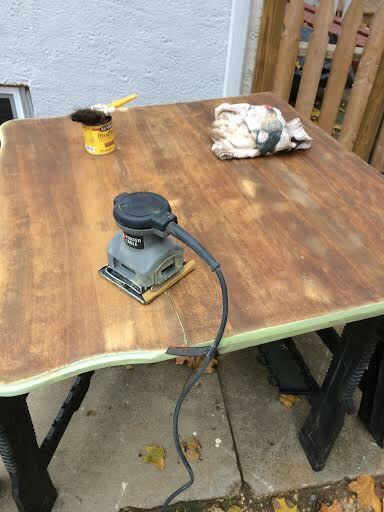 I usually use cloth to stain, but because there are so many spaces to get to with this table, the brush was easier to get to those places. 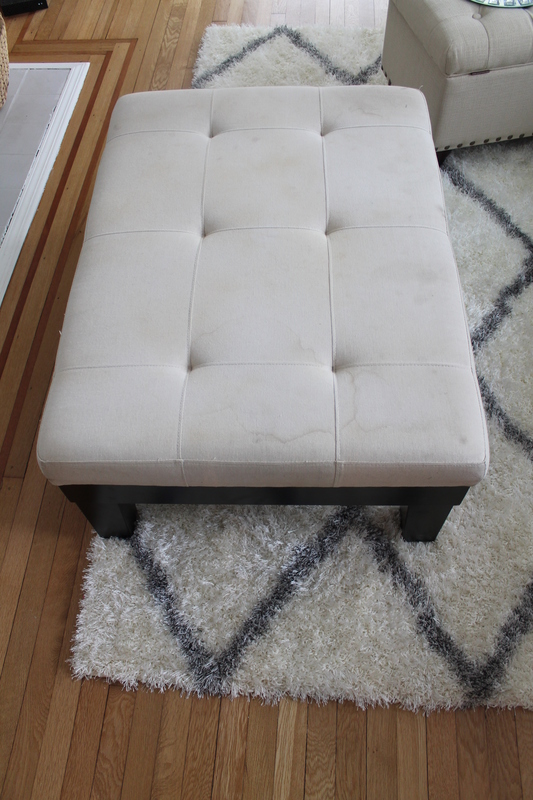 HINT: Remember to wipe away the excess stain with a clean cloth 5min after it’s been sitting there. 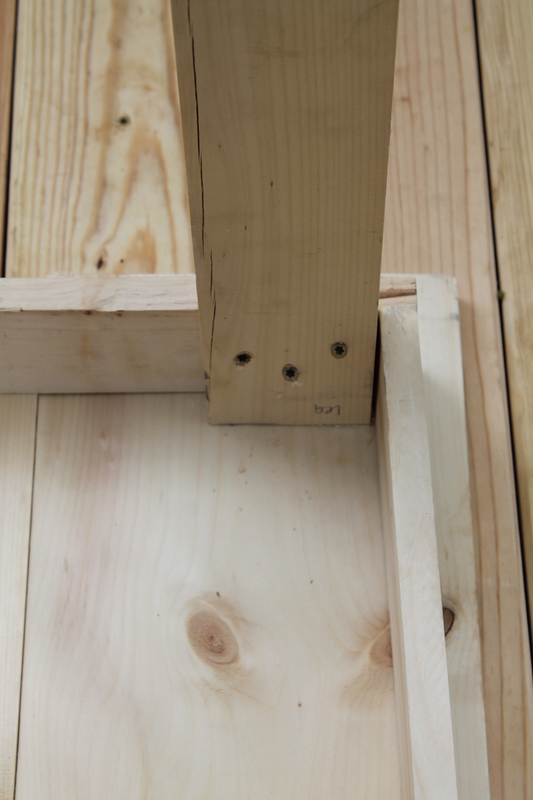 Attach the top of the table to the legs from underneath using long 3 in screws. 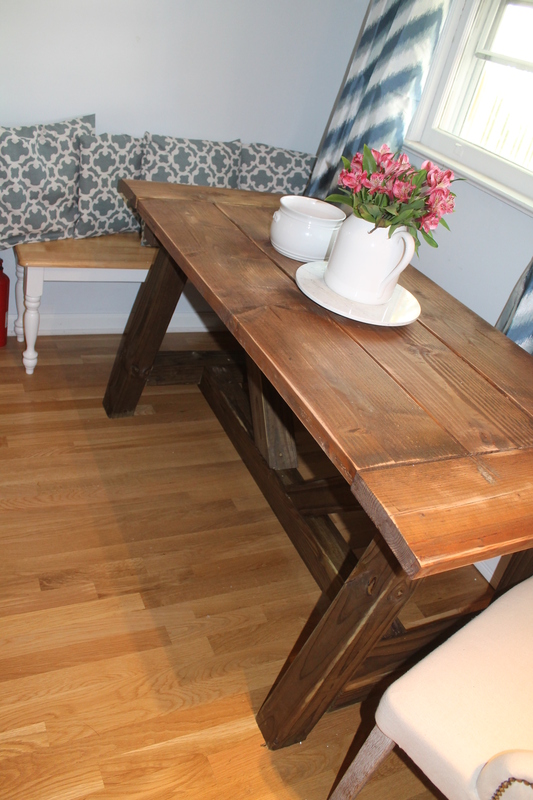 ENJOY AND TAKE A LOT OF PICTURES OF YOUR BEAUTIFUL NEW KITCHEN TABLE THAT COST ONLY $100 RATHER THAN $2300! 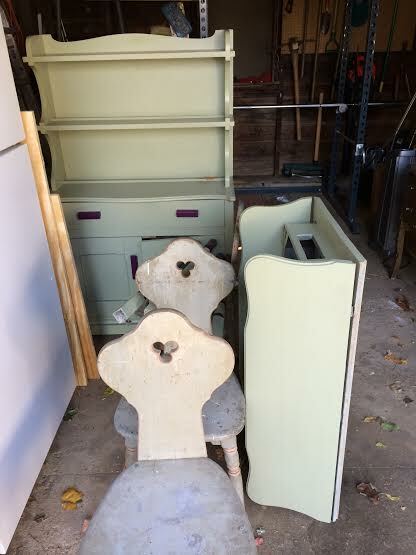 Stay Tuned for the bench I will be making to match! 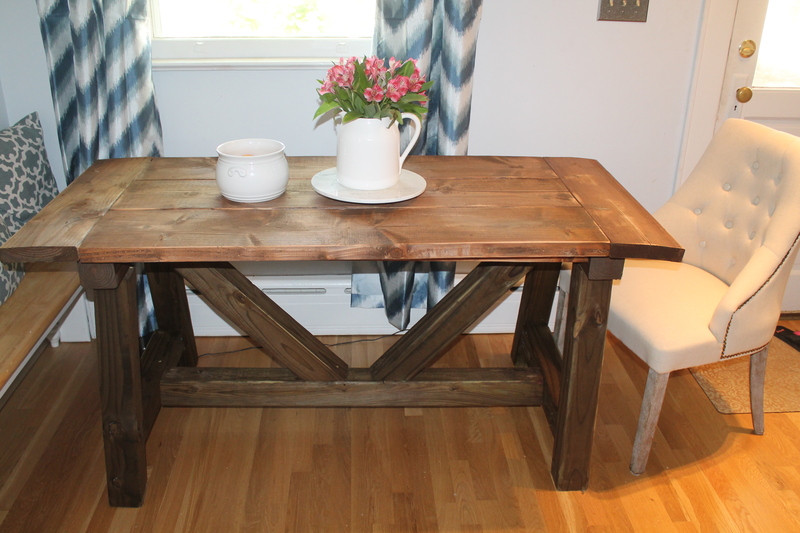 Hope you enjoy and make one of these beautiful tables! Wanted to show you a fun piece I did for a friend! She wanted me to make her boyfriend a sign for his birthday, similar to the sign I made. 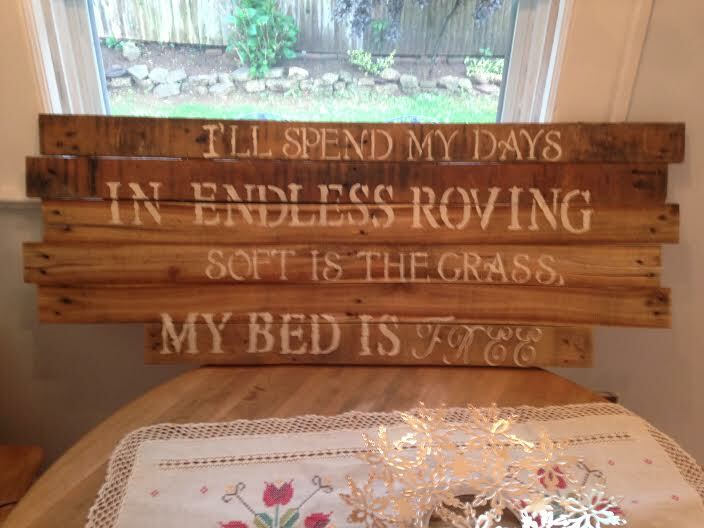 She gave me the quote she wanted and I used the same process to build the sign as I did in that tutorial. **SORRY FOR NO PICS. I did this piece last minute, because I procrastinated :). 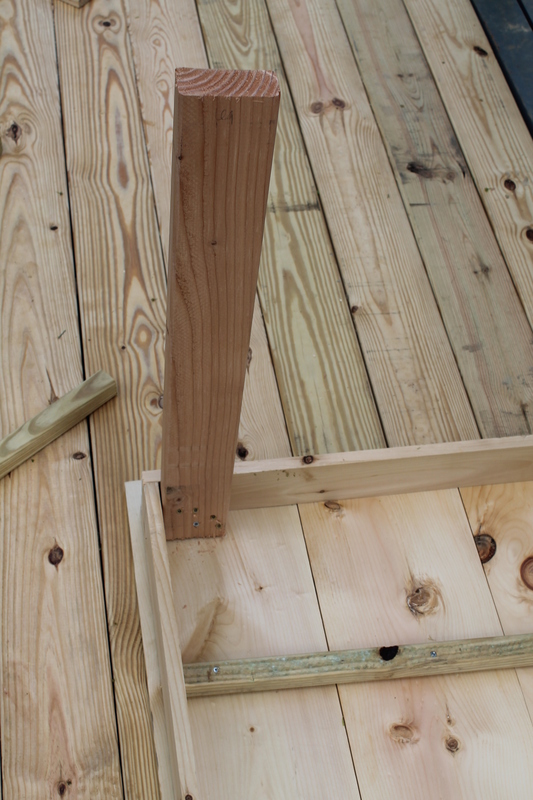 Cut the pallets with the circular saw to the length you want, if necessary. I left them the size they came because she wanted the sign to be above her bed. Next I designed the layout I wanted. You can’t go wrong here. It’s how you want it. They can all be aligned evenly or staggered. Either looks great! 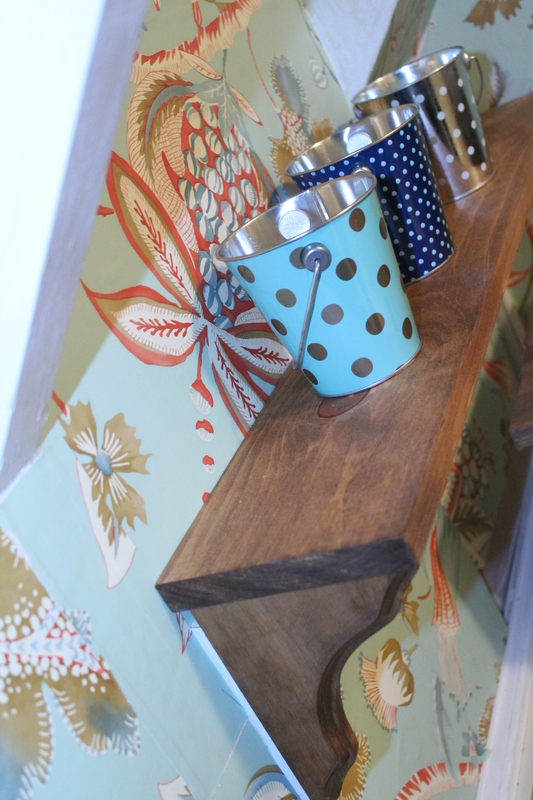 Once you have made sure each wood matches up how you like it, flip it over. 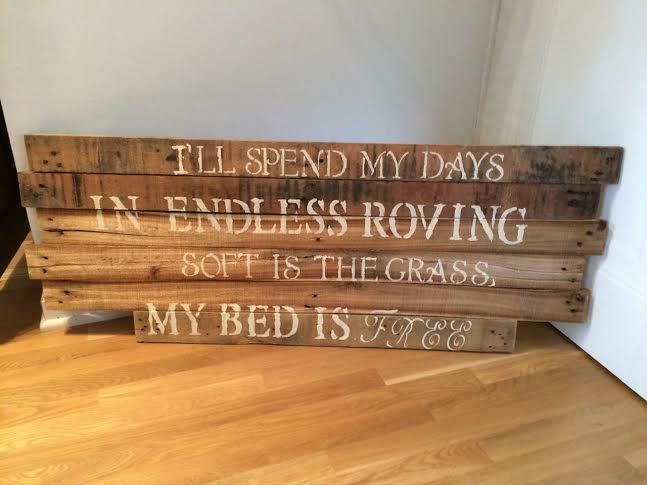 Grab the 2 extra pallets and cut them so the length is a little shorter than the total length of the pallet sign. Screw one on each end of the pallet sign. 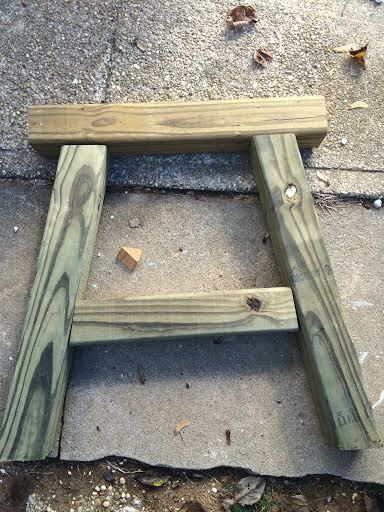 This is to hold the sign together. Make sure you screw into each pallet. 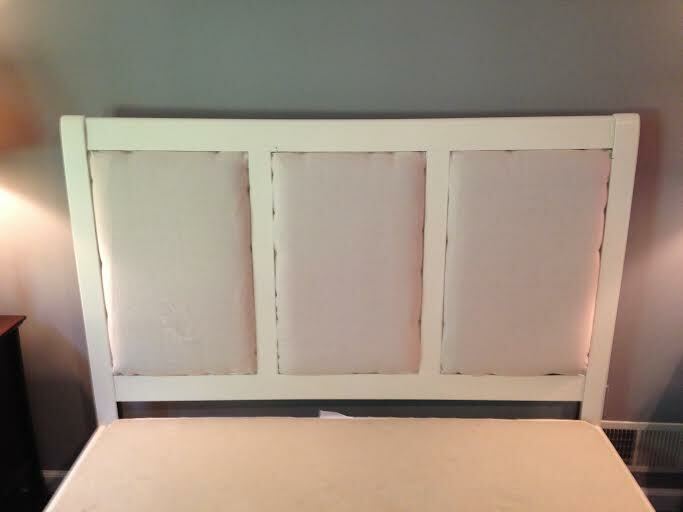 SO there should be 6 screws on each end to hold that back piece of wood in place! And you’re done constructing the sign. See how easy? 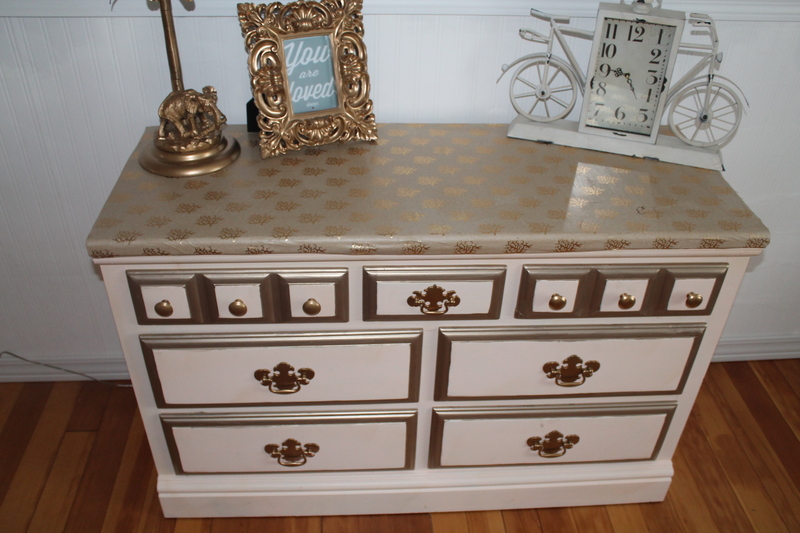 Grab your stencils and stencil away! 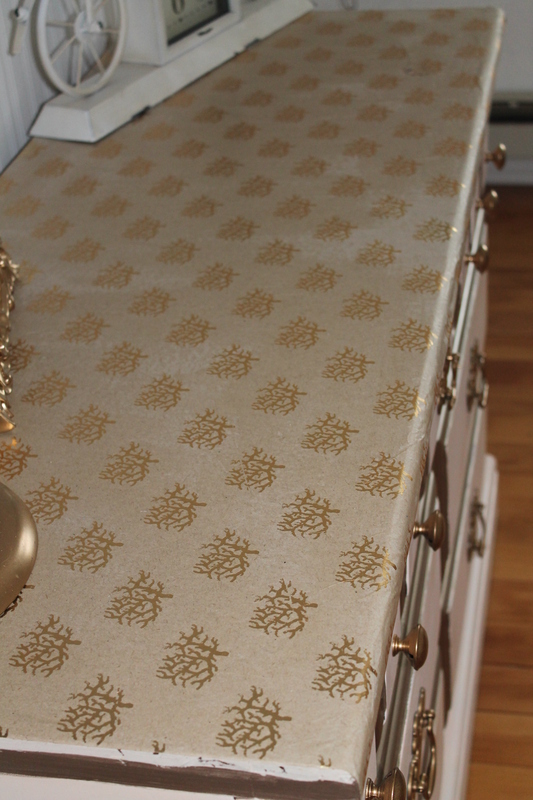 **TIP** After you stencil each individual letter, take the stencil and wipe the back of the letter you just stenciled. 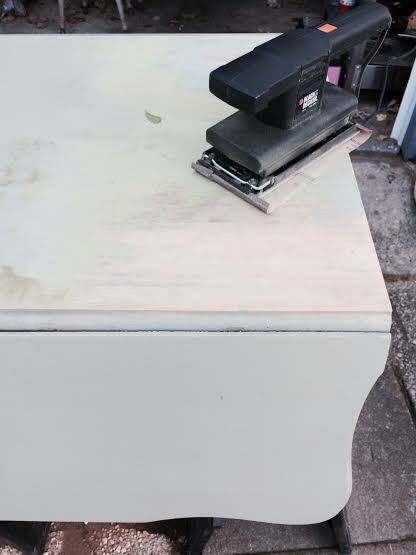 This prevents paint from smearing all over your wood. It’s a tedious process but I find it relaxing! I had one of my first clients! 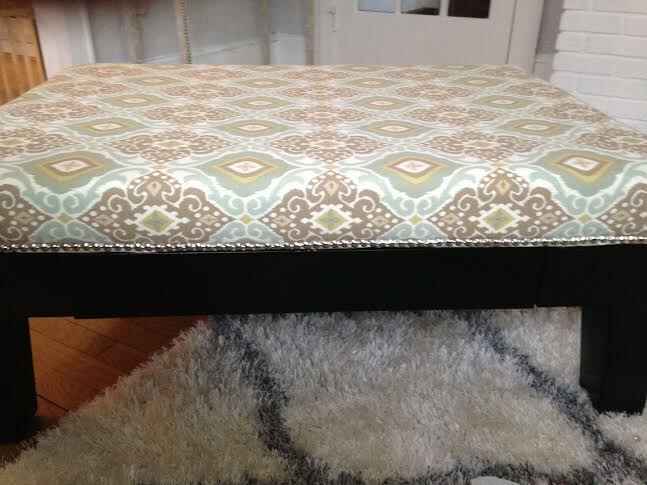 She asked me to reupholster her ottoman! I am loving having this little teeny tiny side business! I really hope to one day have my own shop in town, we’ll see! Which reminds me, if you are interested in my pieces and don’t have the time to use my instructions to make your own pieces, I opened an Etsy Account! Check it out, it’s called ReLoveByAndy. I’m slowly adding pieces to it! She dropped it off, it was a great size! After sending her a bunch of sample pics of material, she picked out the material she liked and I was ready to go! 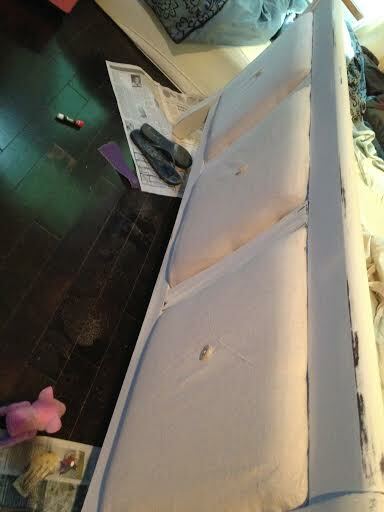 I first carefully removed the fabric. 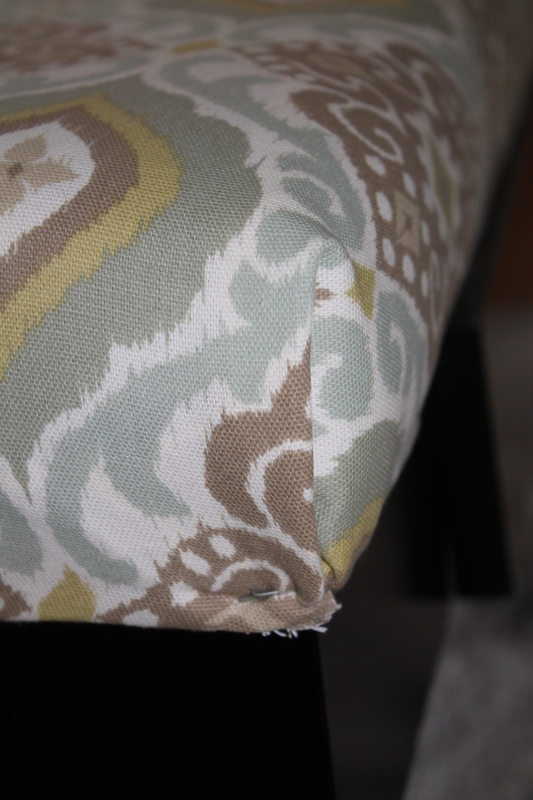 I took each button off by cutting the stitching that attached the buttons to the fabric. 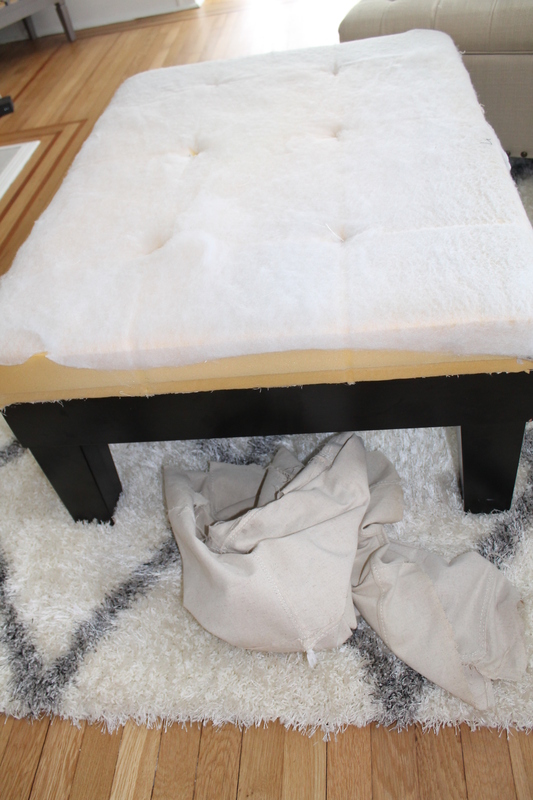 I kept the batting attached to the ottoman, because it was in great shape! 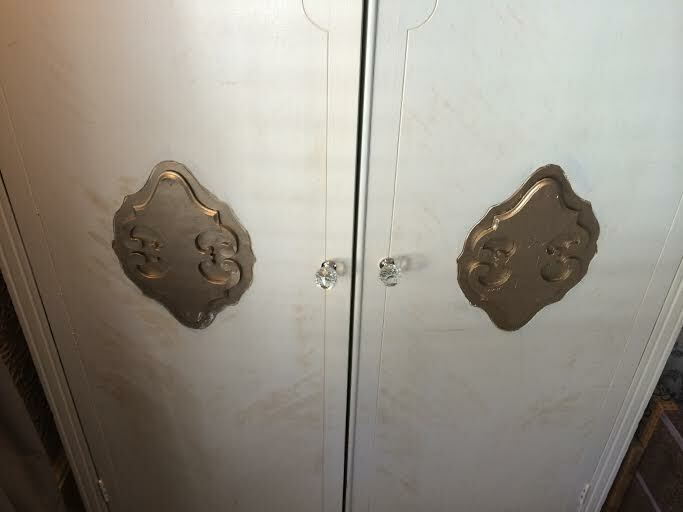 IF it’s a very dated piece, sometimes it’s best to remove the batting and place new on, but if it’s in fine condition-absolutely no reason to remove it! 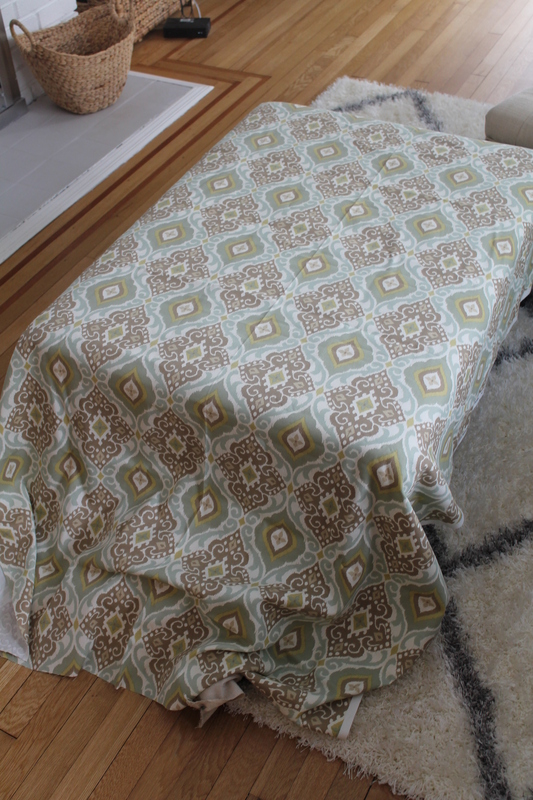 Next I measured the width and length of the ottoman. I cut the material 2in longer than the measurements, just in case. Can always trim the excess. 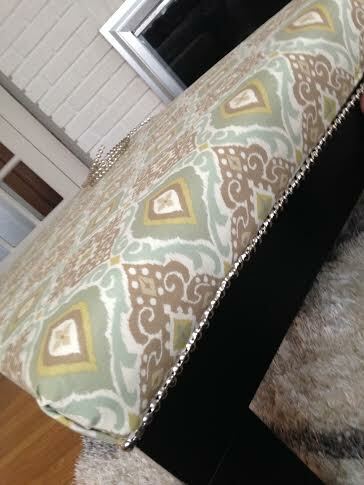 I placed the material on the ottoman and made sure it was on evenly. 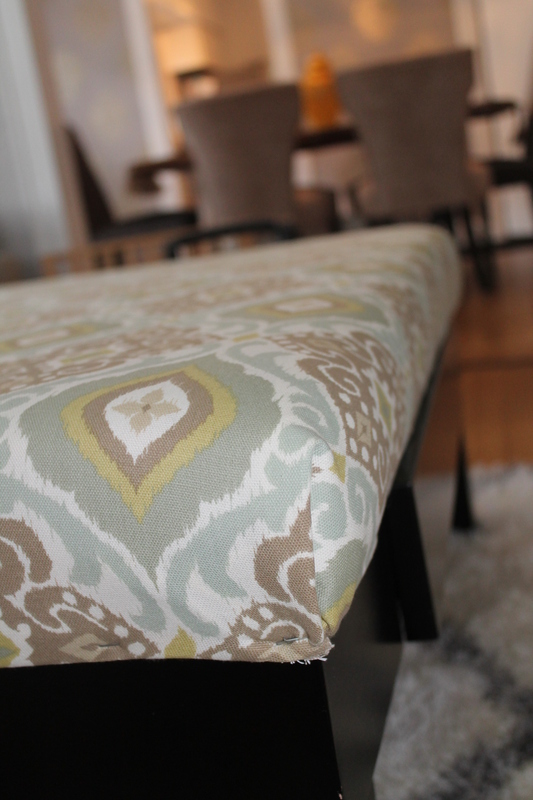 I pulled it very tight and used my staple gun to attach the fabric deep along the seam near the wood so you wouldn’t see the staples. 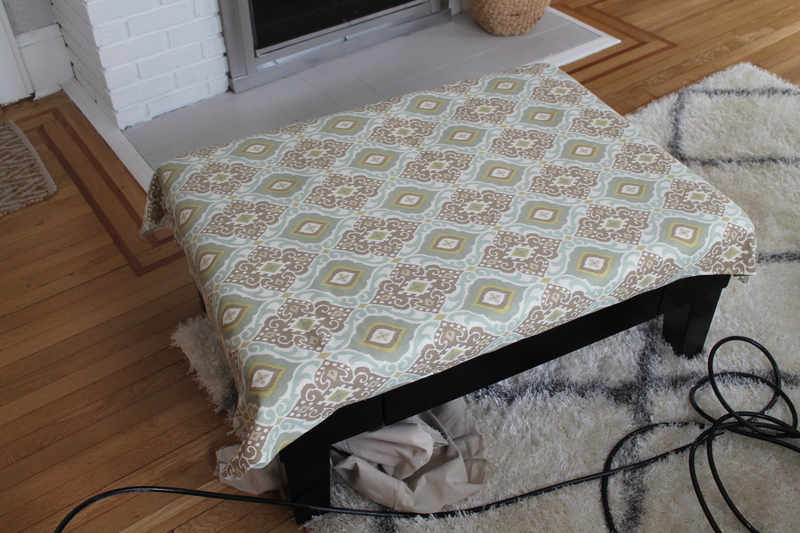 Some ottomans are easier because you can just staple the fabric under the ottoman but this had wood trim around it, so that made it a little more tricky. **TIP** When stapling make sure that the material is snug. 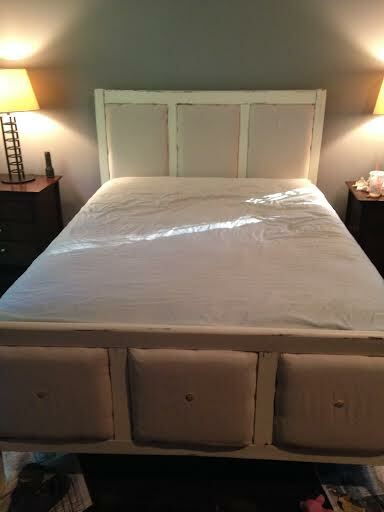 I made the corners similar to “making a hospital bed”. Haha. I am a nurse, so sorry. I tucked the fabric in and then overlapped it. It’s very hard to explain….pictures will show you. I stapled that nice and tight as well. I went around the entire ottoman. 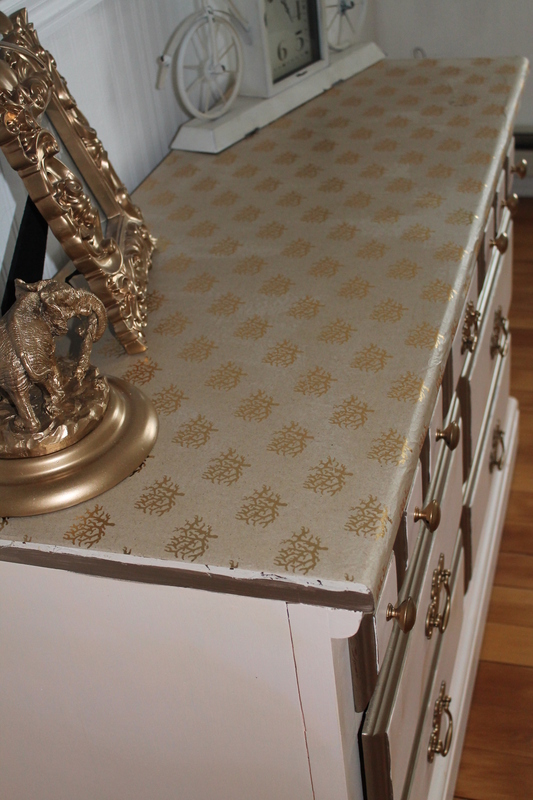 The staples were pretty much hidden, but I wanted to add a final touch of “trim”. 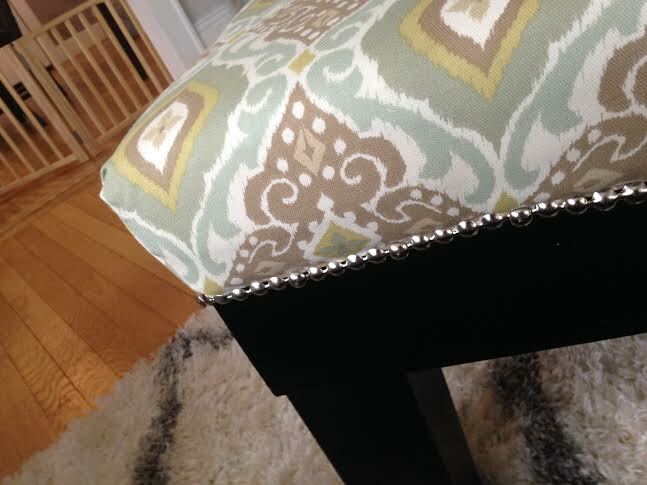 I bought nailhead from ACMoore and added that to the bottom, where the staples were. And it was done! I hope she liked it :). I’m so excited to share this project I did. It may be my favorite yet! I have to give credit to Ana White’s Blog. My husband’s brother referred me to her blog. She is great! Basically, she is who I aspire to be :). I then decided how long I wanted the table to be. The measurements that Ana White’s Tutorial showed, did not match what I wanted. So this is where I kind of went on my own..but thanks Ana White for a great idea of what I should be doing! 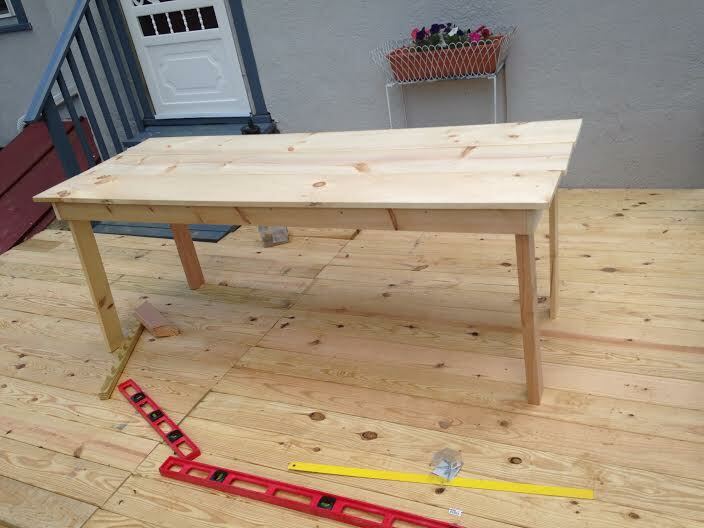 Our deck isn’t that big so I wanted the table to be about 6ft (72in) long. I decided to cut my wood in these measurements. 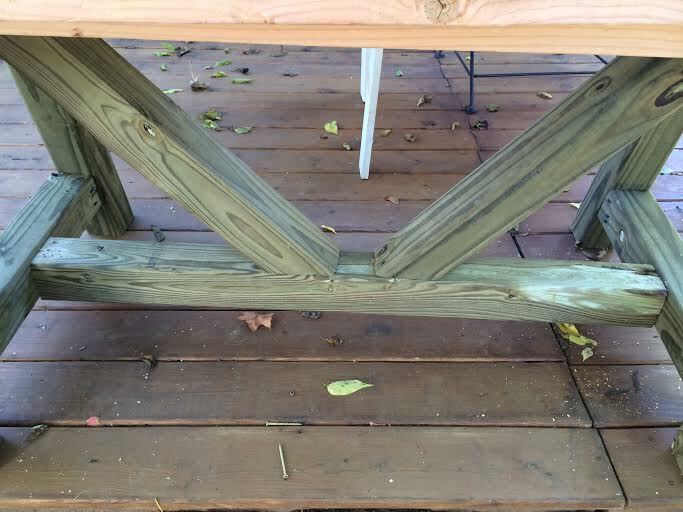 The only time I screwed from the top was at each end of the table. I made sure I really countersunk those screws so that you wouldn’t see them. Then I filled all of the countersunk screws with wood filler! Lastly I added the legs. I screwed 3 screws into each leg. I screwed in an ANGLE, so that the screw wouldn’t come out the other side. 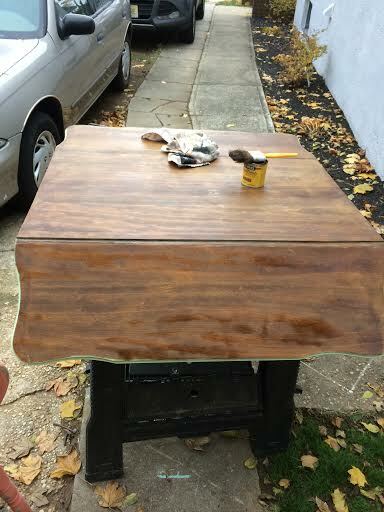 I added Dark Walnut stain to the top (two coats only). 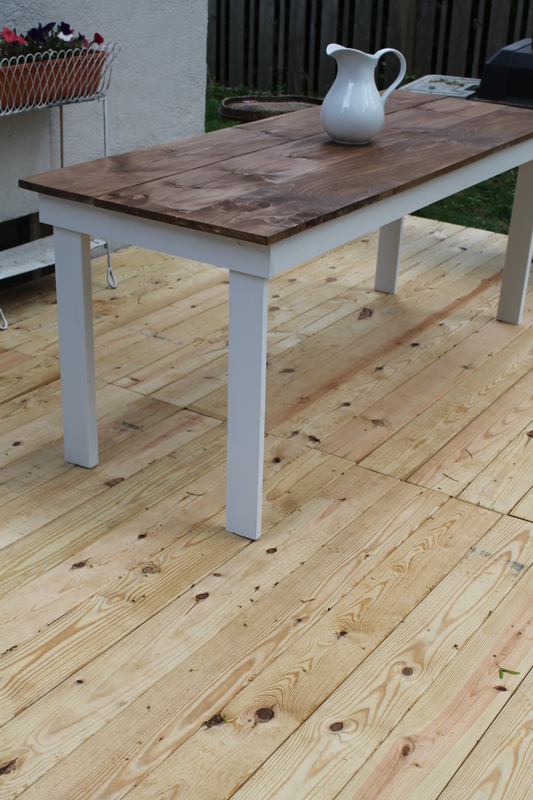 I did two coats of EXTERIOR white paint to the legs and undersides. 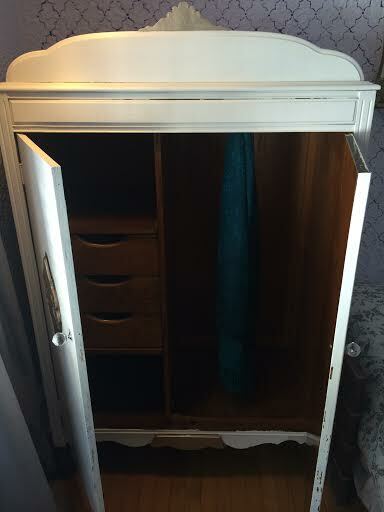 I will add a coat of EXTERIOR wood protector coat to the top as well! And now we have a table to enjoy bbq’s with friends and family! Stay tuned for the BENCH!